Welcome to Mela. Welcome home. And just as I was about to click, I abruptly froze, camera in mid-air. I looked over to my right and was greeted with two very amused facial expressions and two pairs of male eyes staring back at me curiously and expectantly. I chuckled shyly. “You must be wondering about the photos and the camera.” And so began my spiel about how no, this wasn’t my day job exactly, but something I did on the side every day, something that was very much a part of my life in every way that counted, and yes, I write a blog and do a lot of food scrapbooking and photography, and oh, would you like my business card so you guys can check it out?! 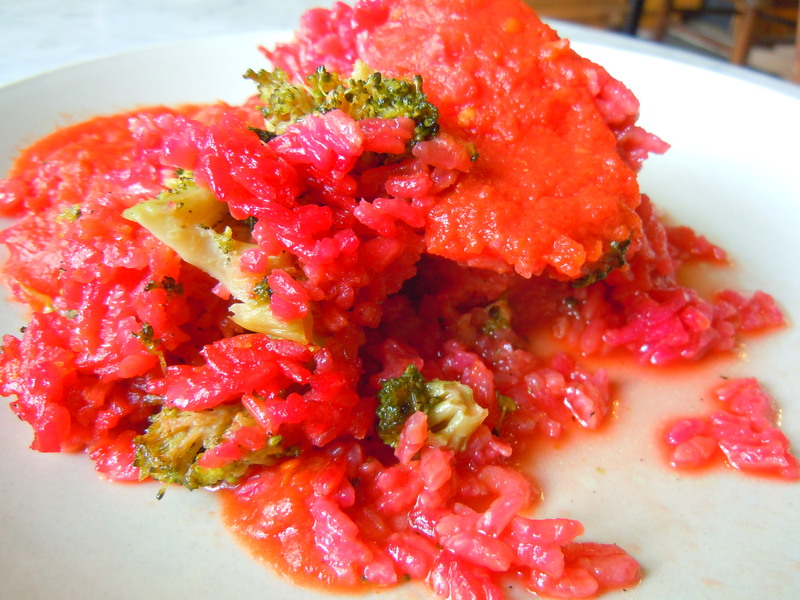 Beet risotto with broccoli and Mela’s famous tomato sauce. 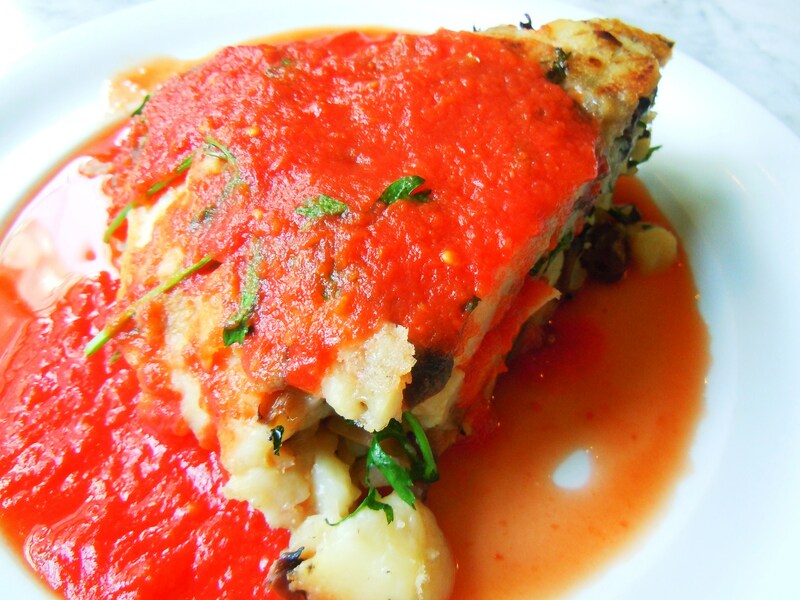 With the sounds of sizzling skillets on the stove top, the smell of fresh tomato sauce bubbling away, and two scrumptious and delicious plates of warm, steaming, comforting Italian vegetarian food in front of me, I felt right at home. It never gets old seeing the curious gazes of nearby patrons watching me snap away, it never gets old pointing my camera at my food, and it never gets old sitting in my foodie home away from home, the Italian vegetarian magic that is Mela Cafe. A giant wave of joy washed over me as I sat inside my favourite vegetarian spot, Mela, for the first time in 8 months. 8 months! 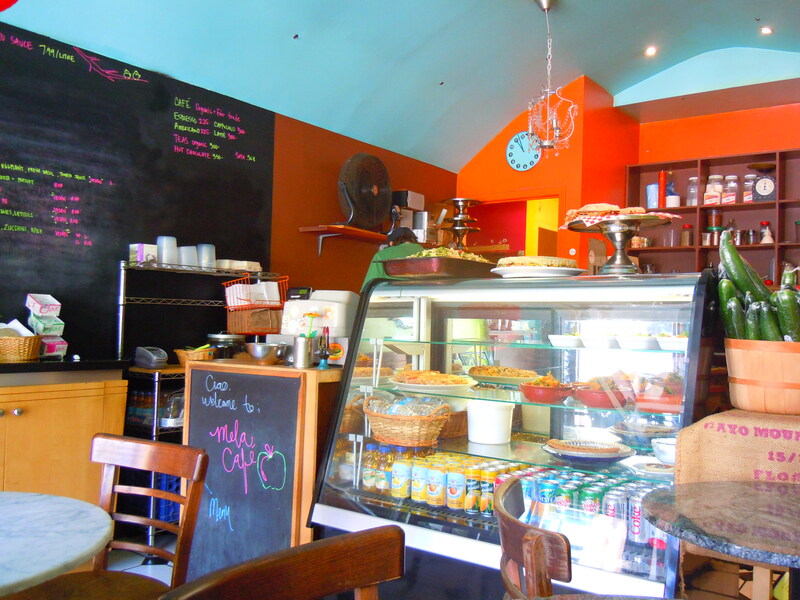 My last Mela Cafe post was 7 months ago, my last visit 8. Since that unforgettable first meeting back in October 2010, I’ve never gone that long without a meal from here. And I was feeling the pangs of withdrawn, especially during this chilly fall weather. Mela does spring and summer fabulously, but I have to say, nobody kicks it in the pants during fall doing fall comfort food like Mela. And were Roberto and Rachel ever dishing out and cooking up a comfort food storm! 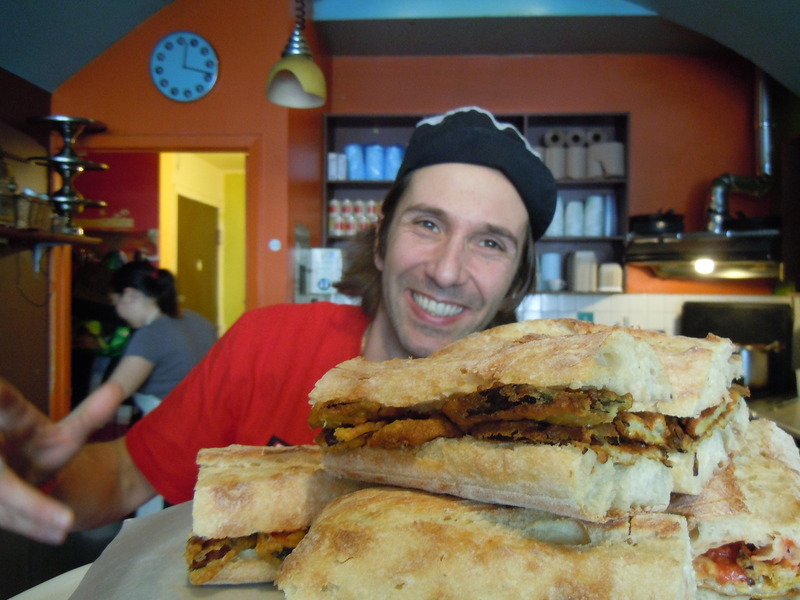 Eggplant parm, beet risotto with broccoli, fresh ricotta lasagna with tomato and basil, cauliflower and soy pie, a spaghetti frittata with lentils and vegetables, red lentil soup, apple, beet and carrot salad, and of course their famous crispy, savoury breaded eggplant and basil panini sandwiches. 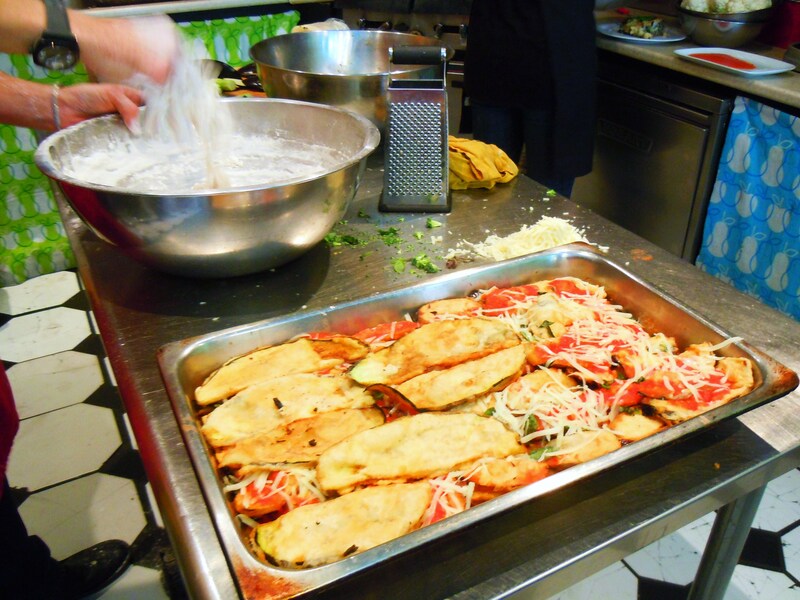 Fresh homemade eggplant parm, ready to get sizzling hot! Roberto in the kitchen (with Rachel in the background! ), whipping up a batch of pizza dough from scratch! This was such a special visit. For starters, it felt so wonderful being back after so many months, eating such yummy food. Second, it was fun talking to fellow foodies about food and blogging. 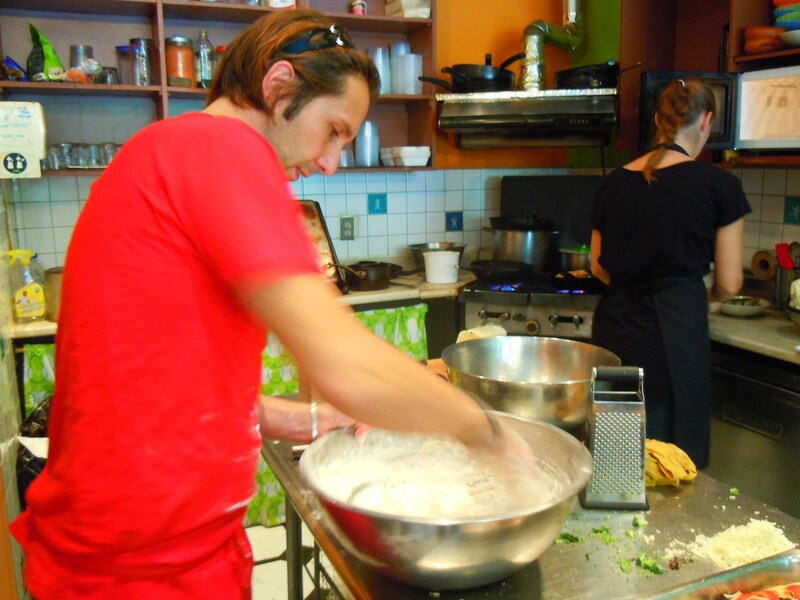 And third, I was beyond giddy when Roberto waved me over into the kitchen to watch him make pizza dough from scratch. I got to stand in the kitchen! Well, colour me absolutely ecstatic! It’s just one of the many reasons why I continue to love Mela so much. I don’t feel like I’m a “customer” here. There’s no wall, no barrier, no pretentiousness. I feel like I’m part of a family. We talk about our lives. I make new friends. I stay awhile and soak in every experience to its fullest. I never feel like I’m a nuisance with the photo snapping. And best of all, I make unforgettable memories each and single time. 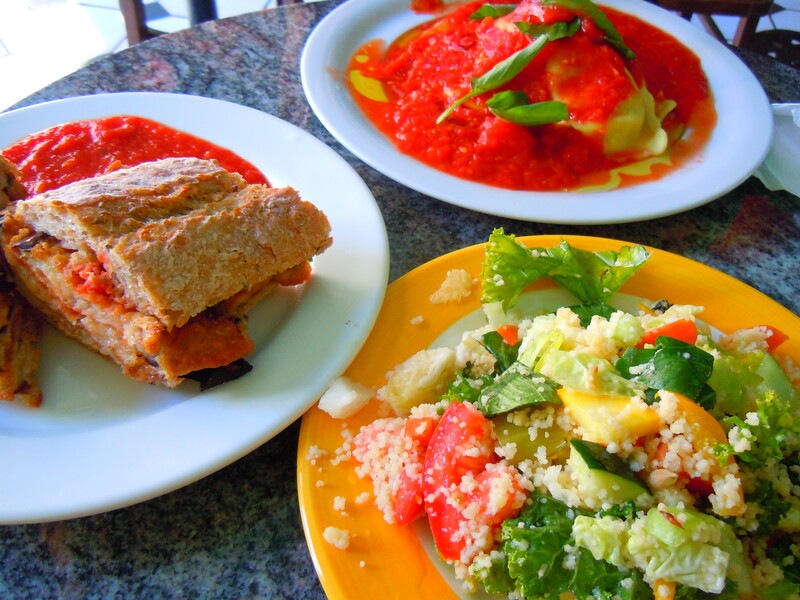 This time around, I sunk my hungry teeth into a giant slice of potato and mushroom pie ($8.41) doused in their famous tomato sauce, as well as a dish of beet risotto with broccoli ($8.41). I was in heaven. Absolute vegetarian heaven. I have to apologize for the lack of beet risotto photos though. The tomato sauce and beet risotto were so close in colour family that I couldn’t get a good enough distinguishing photos. But take it from me, it’s wonderfully delicious and I took most of it home for my family to try, especially my mum who loves beets. Their potato mushroom pie was inches tall and piping hot with chunks of potato, sauteed mushrooms, and parsley melting into every forkful and bite. Comfort food at its best. 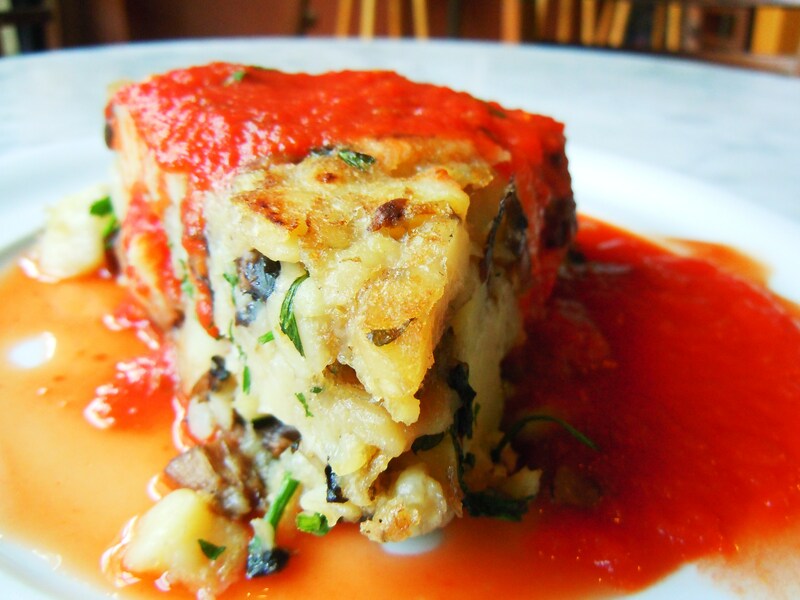 The parsley was the perfect touch, giving little bursts of freshness and greenery to the dish. When I was younger, I never used to like parsley. I would always pick it out of my Vietnamese banh mi sandwiches. Now? 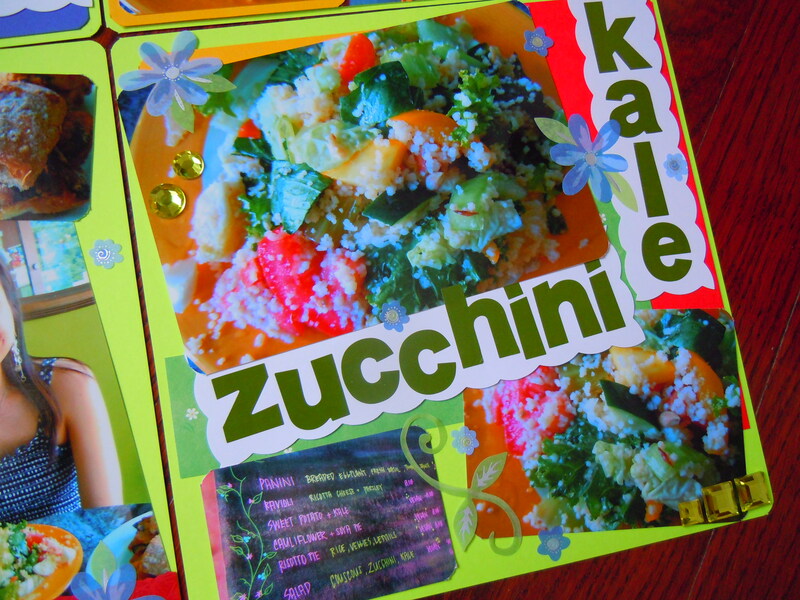 I love it and get so excited when I see it garnishing or sprinkled onto my dish. 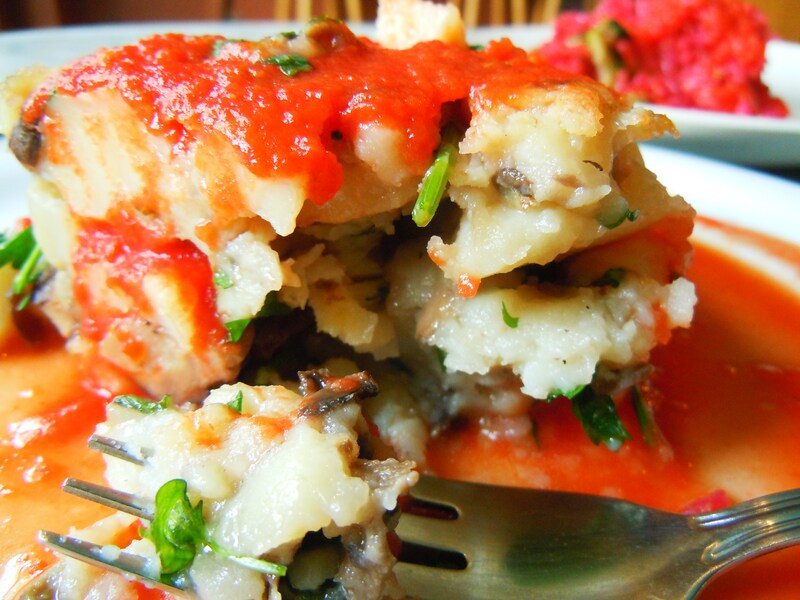 The parsley played a starring role in this one, cutting through the inherent “meaty” texture of chunky potatoes. The potatoes were chunky yet soft; meaty enough to hold its own as a hearty meal with that great potato starchiness but soft enough to sink your teeth right through them. 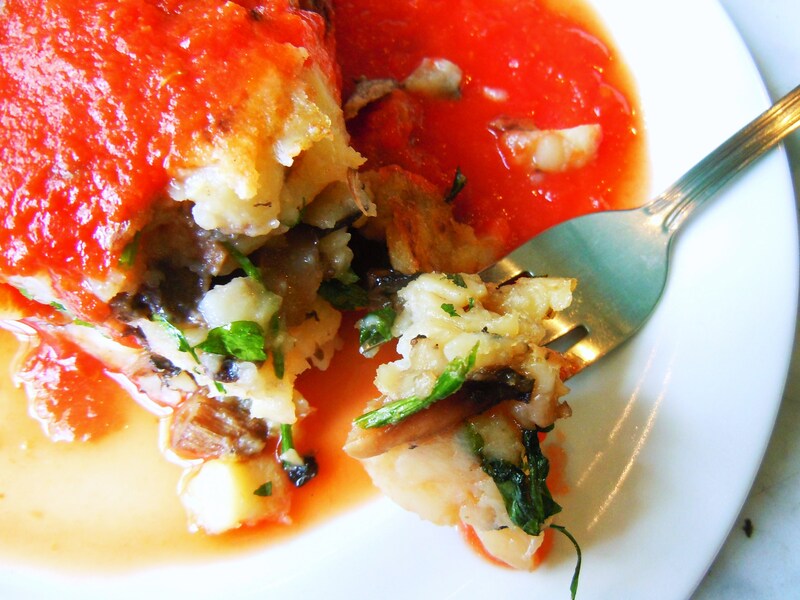 The whole potato and mushroom pie was lovely because it sopped up the tomato sauce so well – I didn’t have a lick of it left by the end of the meal! I won’t, ever. I promise. 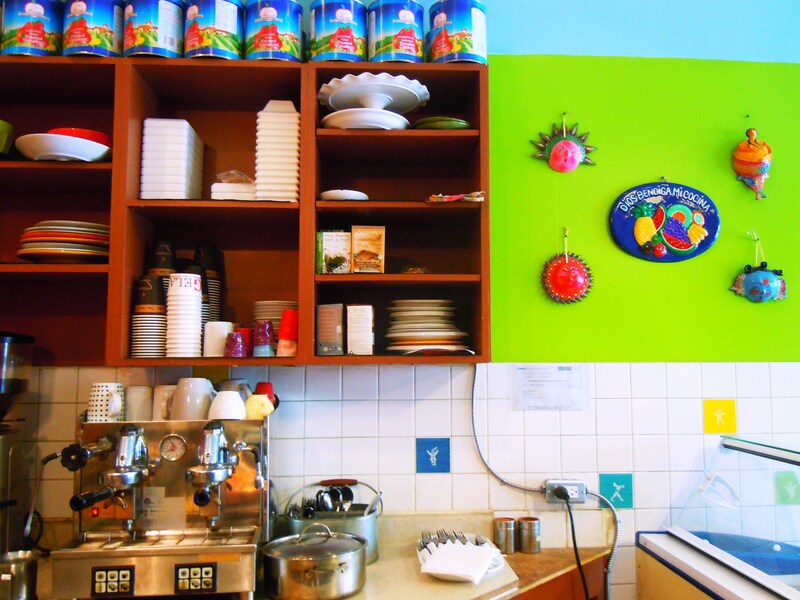 Mela Café is located at 7 Yorkville Ave., north of Cumberland St. and just west of Yonge St. All dishes are either vegetarian or vegan and prices range from $4-$8.50. They are primarily a lunch cafe during the week, open until around 4:30pm-5pm from Monday to Friday, and with later closing hours on Saturday. They are closed on Sunday. Eating at my favourite vegetarian cafe never gets old, especially when I’m greeted by new vegetarian and vegan eats each and every time I go. Thus far, I’ve featured the lasagna, ravioli, curry risotto, stuffed peppers, watercress salad with green beans and chickpeas, breaded eggplant panini sandwich, quinoa salad with cabbage, tomatoes, and parsley, cous cous salad with zucchini and kale, and the ultra special vegan banana cream pie and vegan coconut lime cream tart! I have to admit, that’s a lot of food. Those dishes could form an entire menu all on their own! 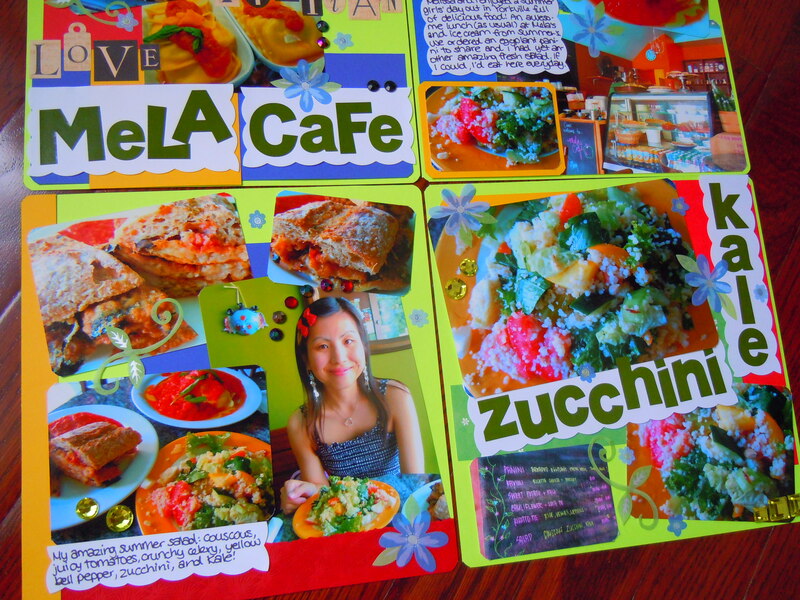 Even though this post marks my 8th Mela Cafe post on the blog (and even though I’ve ate my weight in Italian vegetarian and vegan delights), I’ve barely scratched off a quarter of Mela’s Italian, comfort food menu. For starters, I’ve never had any of Roberto’s soup. 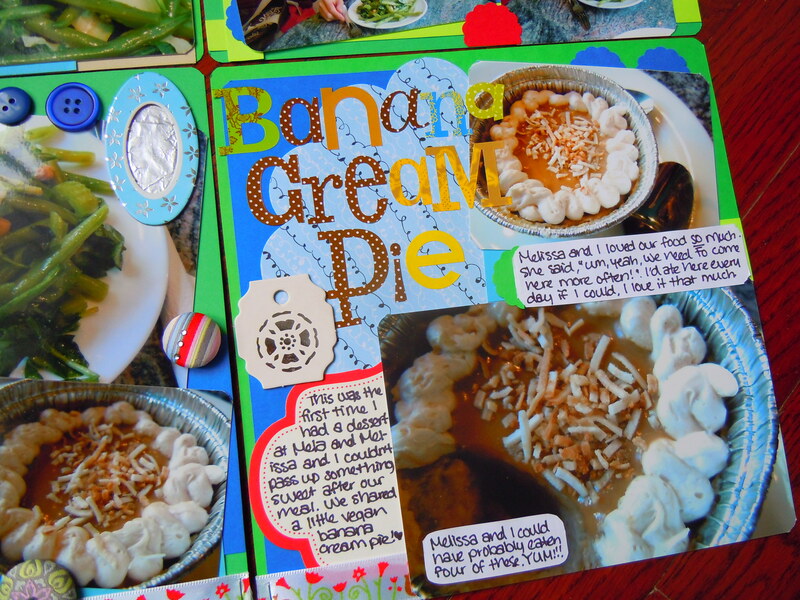 For another, the vegan banana cream pie and coconut lime cream tart are the only desserts I’ve had and I know there is plenty of delicious vegan sugar just waiting to be unearthed for me. Finally, there are always two or three new mains and/or salads listed on the chalkboard menu that I’ve never seen before, which just fuels my fire to try every dish even more! What’s on the menu this time around? 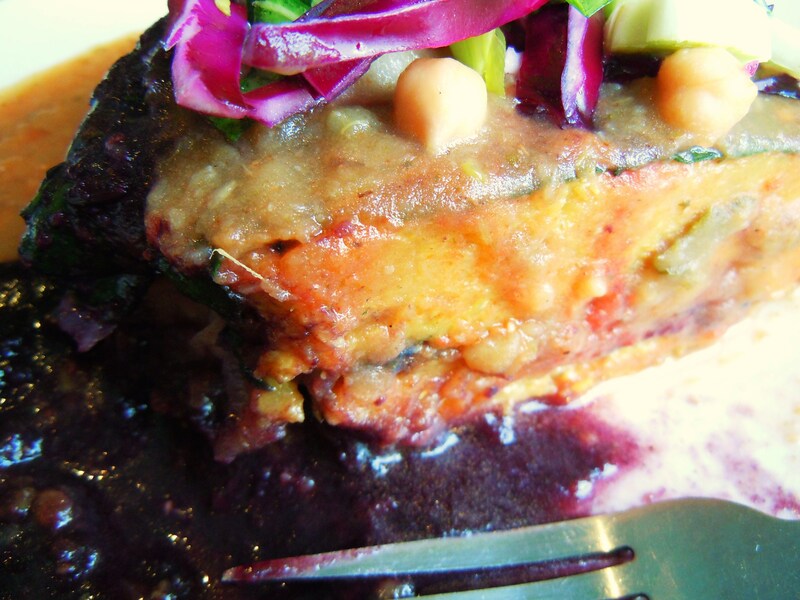 A huge portion of vegan lentil pie bathed in stewed plum tomatoes, chickpeas, shredded red cabbage, and chopped swiss chard! Aside from the mouthwatering food and sweet company, one of the best things about Mela is its ability to make me stuff my face with specific vegetables I don’t even like! Cauliflower and cabbage are two of my least favourite vegetables and it’s only been recently (re: Luscious Dips’ edible cabbage and veggie hummus bowls at the Lunchtime Office Markets) that I’ve started warming up to the purplish veggie. While my mum and brother gorge on coleslaw, I usually opt for something else. And between cauliflower and broccoli, there’s never a contest. 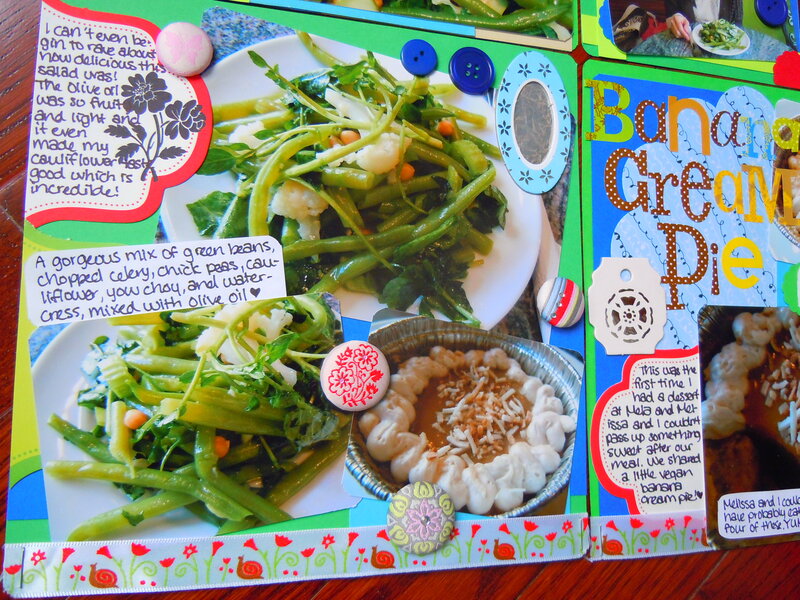 Cauliflower’s green cousin wins the coveted “I get to be eaten by Deb” title every time. But lo and behold, I’m scarfing down a stuffed pepper with cauliflower in it and around it (in soup form) and a giant wedge of lentil pie literally dressed in shredded cabbage. And it was divine. The textures were all over the place with the raw, crunchy vegetables on top, the smooth and savoury lentil mash in the middle, and the saucy vegetable purees at the bottom. It was incredibly filling and hearty (I rolled out of the cafe afterward) and it was like eating extra special mashed potatoes, only they were even more special because they were mashed lentils! 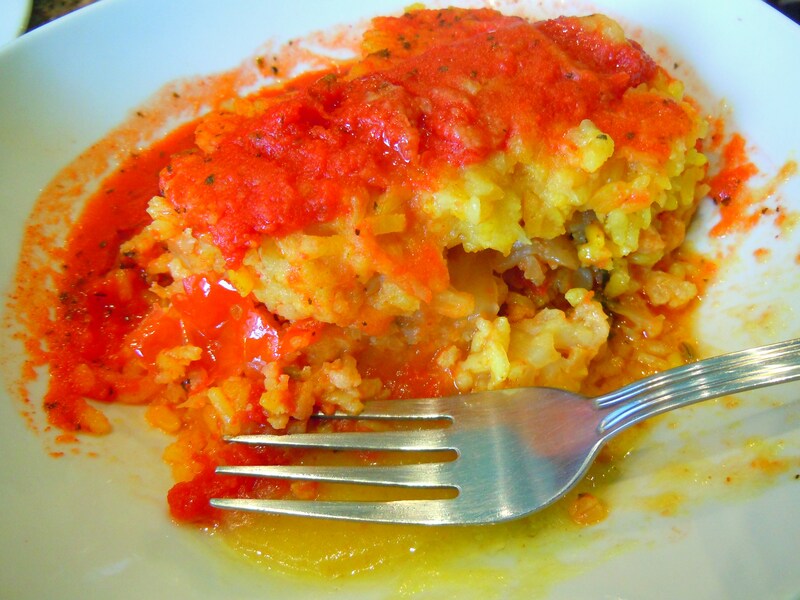 The cabbage and vegetable puree sauce kept the lentil pie from being too starchy and the fresh raw vegetables and chickpeas lightened the entire dish. It was beautiful to look at (how often do we eat purple food?! ), beautiful to eat, and an absolute joy to eat in the company of a new friend I made on this particular day who just happened to order the same thing I did! 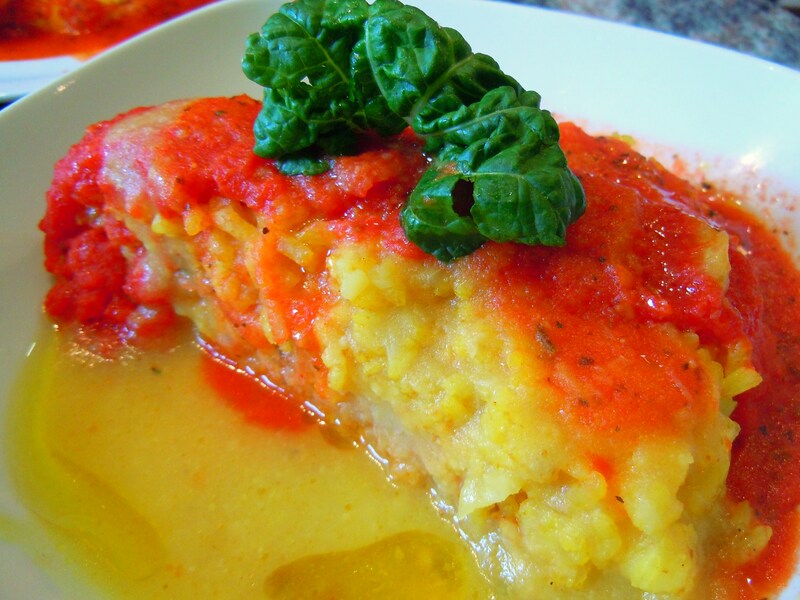 Who knew lentil pie could form a friendship? 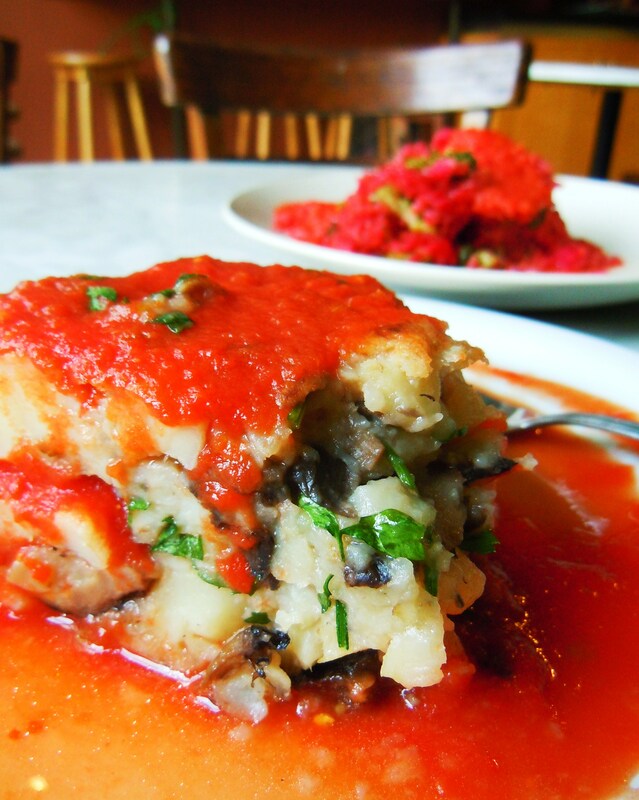 The chilly fall season wouldn’t be complete without a warm, comforting, fall harvest meal from my favourite Italian vegetarian place! I know that even though it’s technically still fall, we’re sort of in a weird place right now where the leaves have fallen, the trees are naked, and we’re donning sunglasses in the mild weather one day and bundling up to our ears in winter clothes the next. Winter hasn’t taken over just yet though so I think it’s safe to continue doing Fall Harvest posts, especially when they’re as bright, vibrant, and colourful as this! 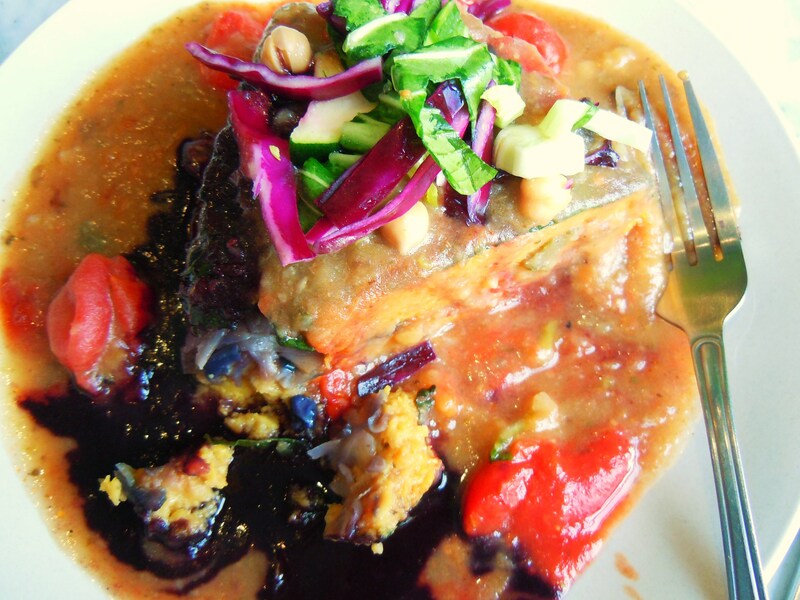 Roberto’s amazing, delicious vegetarian and vegan food has never failed to brighten up a meal, but this fall comfort lunch was like rainbow artwork on plates. I’ve been eating at Mela for over a year now and I’ve loved watching the seasonal fluctuations and changes in ingredients and dishes. The everyday stand-bys such as the breaded eggplant panini and homemade ravioli with ricotta are present at all times, but menu items such as the vegan coconut lime cream tarts and summer vegetable salads have summer sunshine written all over them, while warm comfort foods such as rice and potatoes with root vegetable like beet and rapini provide that sense of warmth and coziness during the cold winter months. I got the chance to see and eat some wonderful fall food this time and it was beautiful, artistic, and of course, delicious. 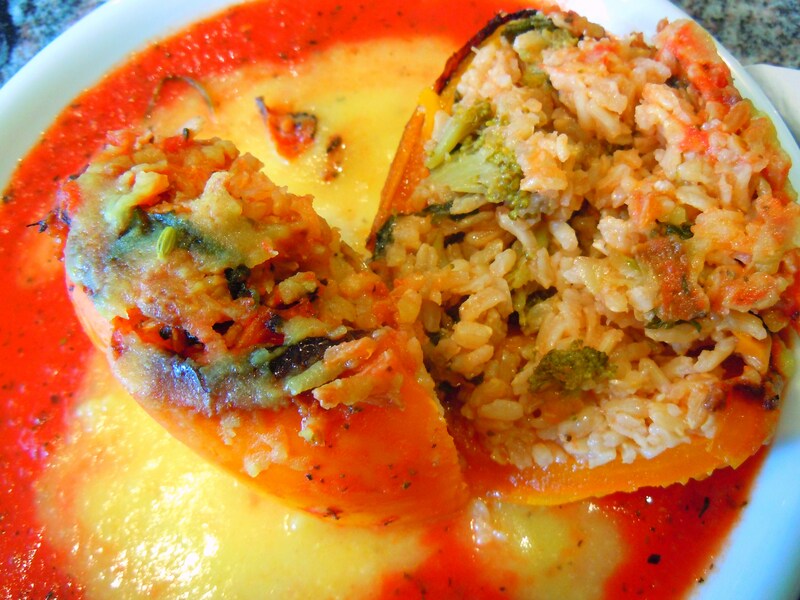 This time around I stuffed my face into a new menu item as well as a consistent classic: curry cauliflower risotto and veggie stuffed bell peppers! 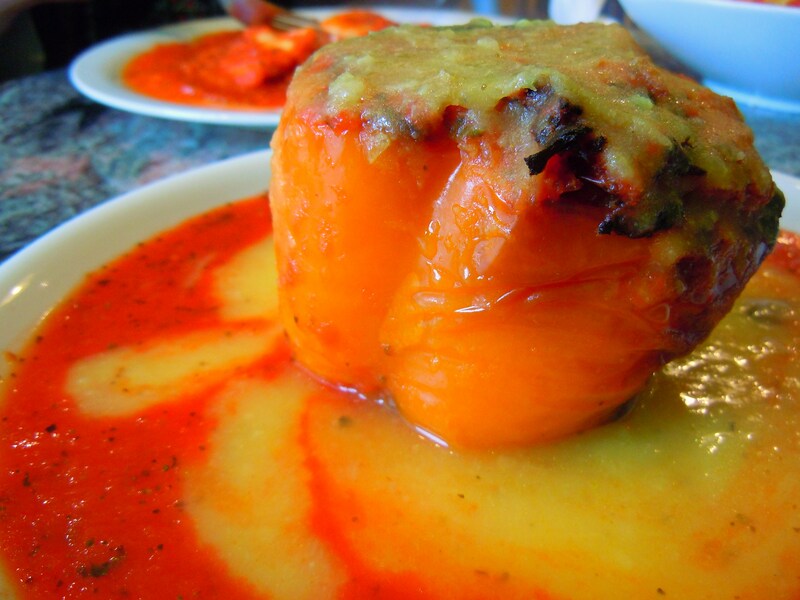 The orange bell peppers were grilled and stuffed with rice, tomatoes, onions, and broccoli and were super soft with that perfect blistered skin. One thing that really delighted me was the artwork on my plate. 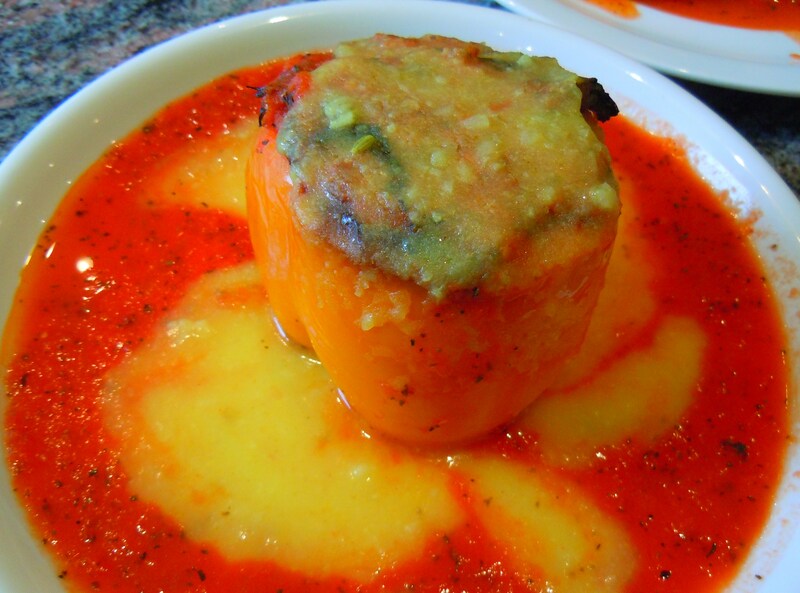 Roberto had created a soup painting beneath the stuffed bell pepper! Check it out. I couldn’t believe it. Forget latte art, bring on the adorable shapes made out of soup! Roberto had poured the cauliflower soup into the tomato sauce in such a way that the shape of an apple formed right under my lovely bell pepper. I literally did a double take when I saw it and I almost didn’t want to disrupt the masterpiece by cutting into the pepper. But alas, nature called and I was hungry so I captured eleventy billion photos of it before it went away. Food artistry at its finest. Here’s the thing though: I DON’T EVEN LIKE CAULIFLOWER. I’ve grown to love many foods I used to wrinkle my nose at when I was younger, but cauliflower has always remained on my “I do not fancy you” list. Which begs the question, “why did I decide on these dishes if I don’t even care for cauliflower?” Simply put, I wanted to give broccoli’s much paler cousin a shot. This fall, my mum started integrating more cauliflower into our vegetable dishes at home and I found myself enjoying it so much more when she made them. Call it bias toward my mum’s home cooking, call it a foodie epiphany; I didn’t hate it as much as I used to. However, I only preferred it the way my mum cooked it because to me, and forgive me for saying this, every other cauliflower experience has tasted awful. I might as well have been eating cardboard. Which means my choosing a dish with cauliflower in it at Mela was a big deal. I was putting my faith in Roberto on this one. The verdict? You know food is good when you start scarfing down things you’ve disliked for years. Although I enjoyed the stuffed bell pepper (goodness do I ever love the char and blistered pepper skin done right), it was the curry cauliflower risotto that completely won me over and had me “mmm”ing for a good half hour straight! It was so incredibly delicious and flavourful and so colourful. It was a joy to look at and an even bigger joy to eat. I love risotto to pieces because the creaminess of it just makes me want to go into spoon-to-mouth shovel mode and I get so excited whenever I get the chance to eat it. It’s like rice stew and the versatility of it means endless ingredient possibilities. I have never had a curry risotto before. Mushroom risotto, yes. 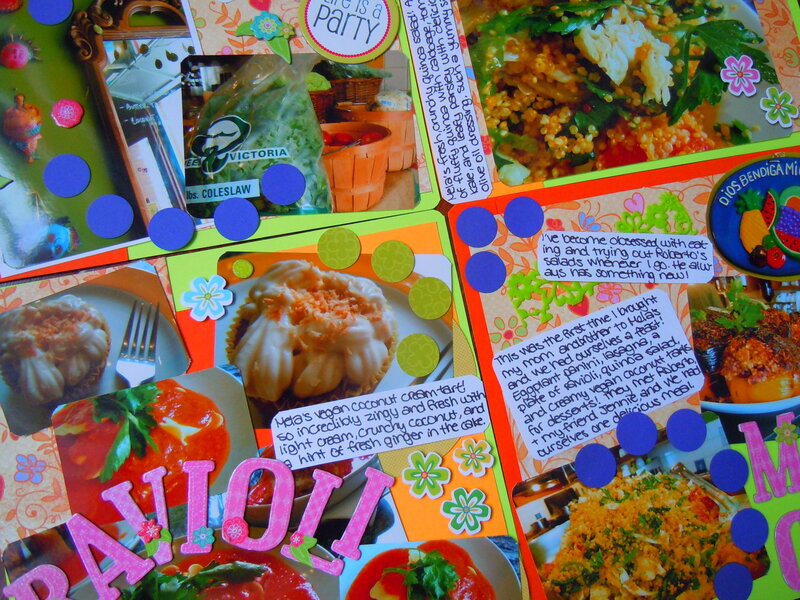 One of my friends even made a fabulous, homemade walnut, apple, blue cheese risotto for a dinner party a few years ago. 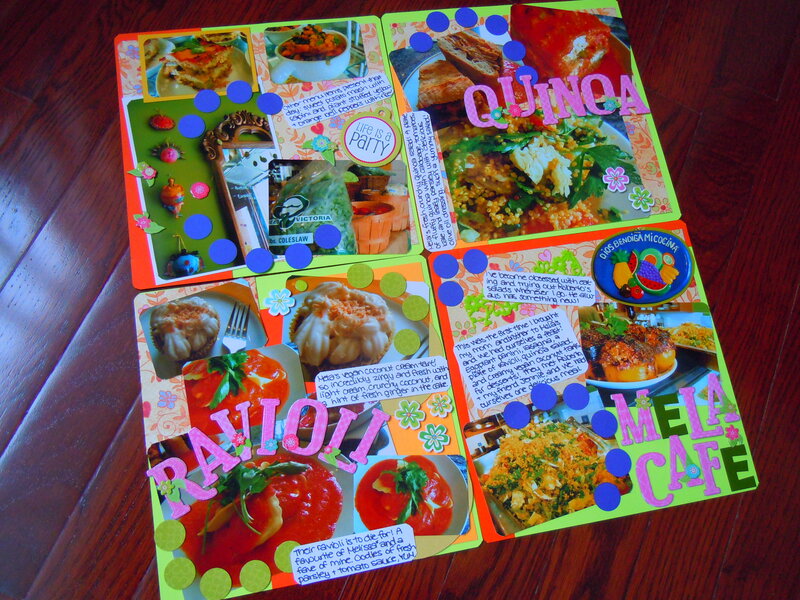 But curry risotto? That combination hadn’t even entered my foodie universe. 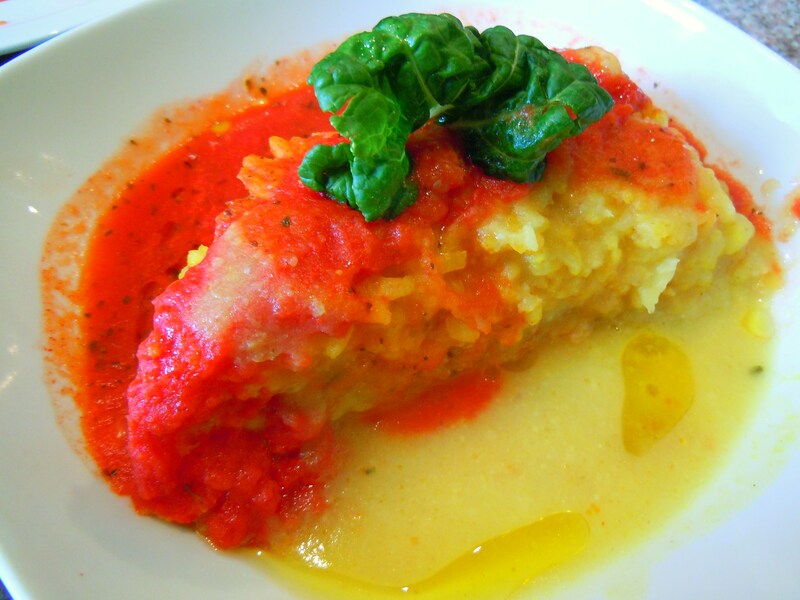 The curry cauliflower risotto was served as a triangular “pie” slice with rich, creamy curry rice and chunks of cauliflower sitting in a plate of cauliflower soup with olive oil drizzle, topped with Mela’s famous piping hot tomato sauce. The curry was like a bursting firework of savoury flavour and the risotto was perfectly creamy and smooth without being mushy. You could taste every rice grain with the tomato sauce and curry intertwining into one mouthful of pure heaven. Every time I come to Mela I’m eating something wonderfully delicious and it’s becoming increasingly difficult to choose between items and to pick a favourite! Hands down, the curry cauliflower risotto is in my top 3 favourite things here at Mela. 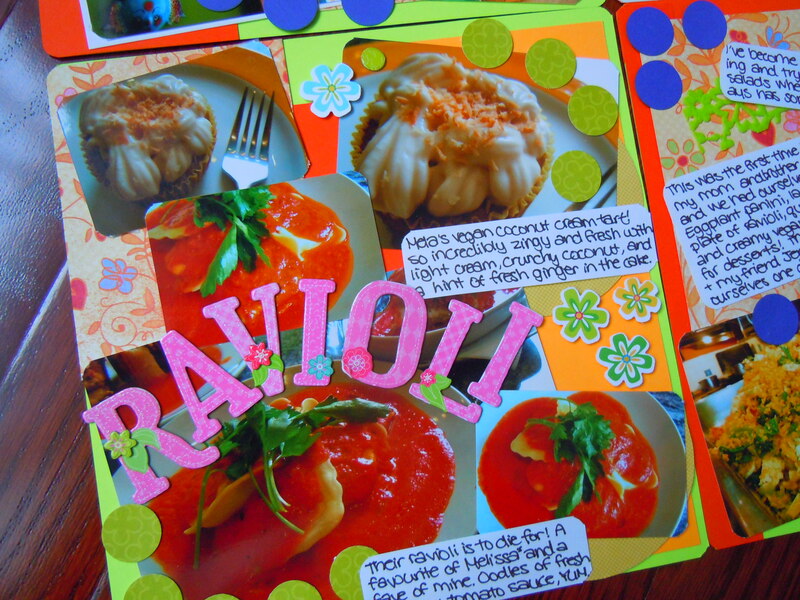 The ravioli is in this top 3 too, but that’s about the best I can do because I can’t settle on another item to round the list out. Winter is quickly approaching and I’m looking forward to another visit and I can’t wait to see (and taste) the scrumptious goodies waiting for me. 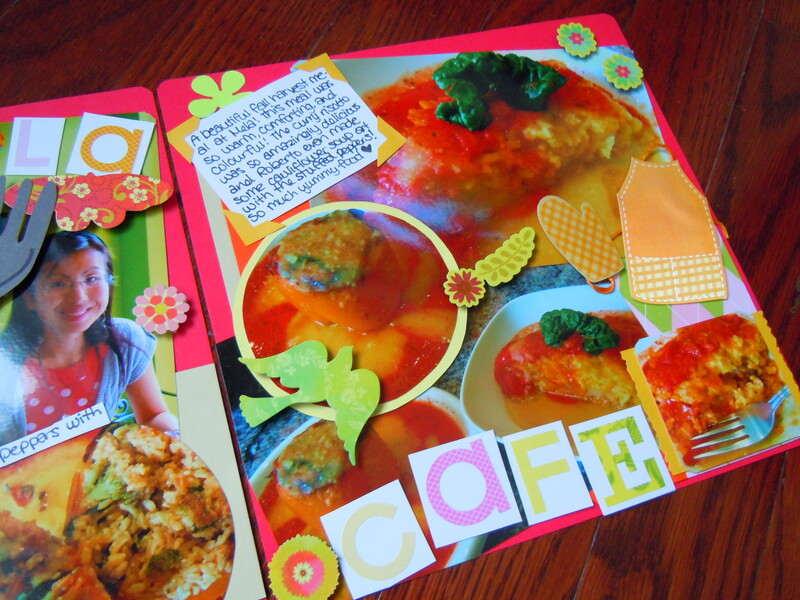 Scrapbook materials used: Poppy red, orange, pale yellow, neon green, and cappuccino cardstock; apron and oven mitt adhesive embellishments (In the Kitchen by Karen Foster Design); alphabet stickers (K&Company); floral die-cuts (K&Company); 5-petal paper punch (ek success). I have a confession to make. I love Mela Cafe so much that I was thrown into conniptions a little over a month ago when I made plans to go for lunch and found the cafe closed with its lights off, its chairs off the floor, its shelves normally stocked full of tomato sauce completely empty and bare, and its signature “garage door” storefront covered with newspapers. I smushed my nose against the glass door, peered inside, and nearly had a heart attack. I turned around to face my boyfriend with my mouth gaping open, speechless for about a minute before I found my vocal cords and started babbling like a hysterical nut. “Oh my god…oh my god…why aren’t they open?! They couldn’t have packed up, that doesn’t make sense! People love it here! I love it here! There would be a sign! But why are the tomato sauce cans gone?! Are they renovating? I’m panicking. Am I panicking?” I walked around in a daze for the entire day and had no idea what to do with myself. Fast forward two weeks later. I was in the area again during the day so I took a deep breath, and went over to Yorkville Ave. to see my beloved Mela. To my utter relief, delight, and elation, Mela’s storefront was open with a smiling Roberto and a fresh coat of paint inside. They had closed for renovation! I skipped on inside, got a hug from Roberto, and was grinning from ear to ear – crisis averted. I could go back to eating myself silly! And just think, with fall upon us, I’m positive Roberto has a host of new menu items to dish out with fall fruits and vegetables. I’m mega excited. Tomorrow marks the 1-year anniversary of my very first visit to Mela. 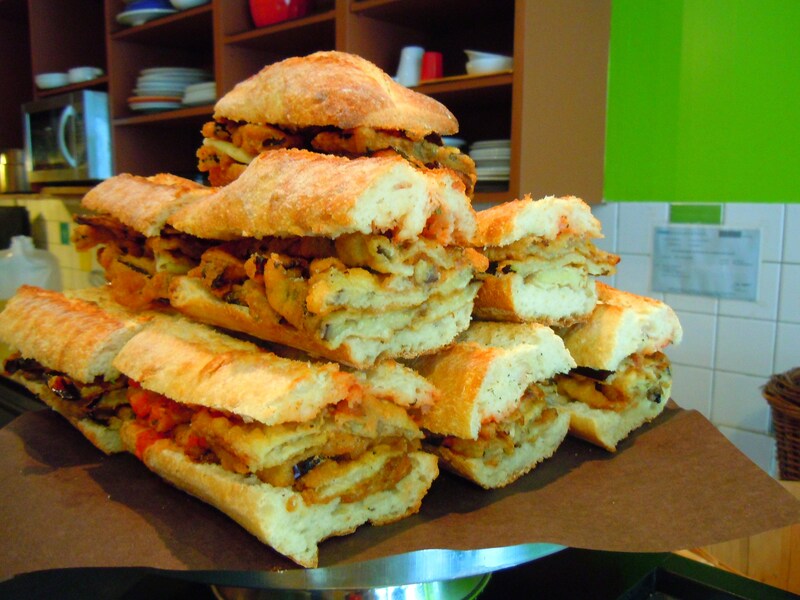 Exactly one year ago, I walked along Yorkville Ave. like any other regular day in the neighbourhood, saw Mela’s bright orange storefront, saw the words “Italian Vegetarian Magic”, stepped into the Italian vegetarian and vegan eatery, and never looked back from that day on. This past year at Mela has created so many sweet memories and as my favourite vegetarain and vegan place in the city, I can’t imagine it ever being absent from my life. I took my mum, brother, and best friend here for the first time during the spring, got my best friend obsessed with their ravioli and vegan banana cream pies, made a sweet friend named Jennie who frequents Mela on a weekly basis, got to know Roberto and the other ladies who help him make his mouth-watering dishes, asked my boyfriend for his metropass while he was working at school so I could eat ravioli in the dead of winter, and had so much delicious food, including this salad! 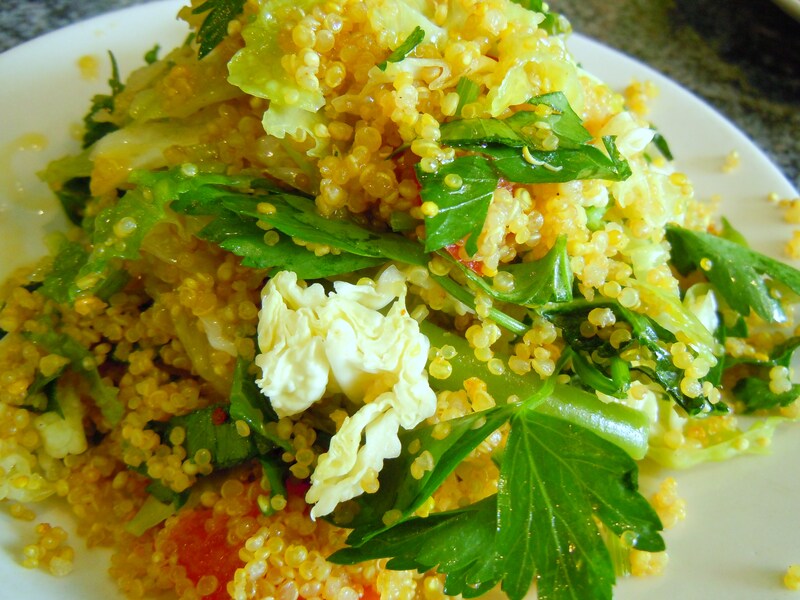 Last time, I showed you all Roberto’s quinoa salad with crunchy cabbage, green beans, tomatoes, olive oil, and lots of parsley, and the time before that I proudly displayed his springtime salad with watercress, green beans, Shanghai bok choy, cauliflower, chickpeas, and olive oil. 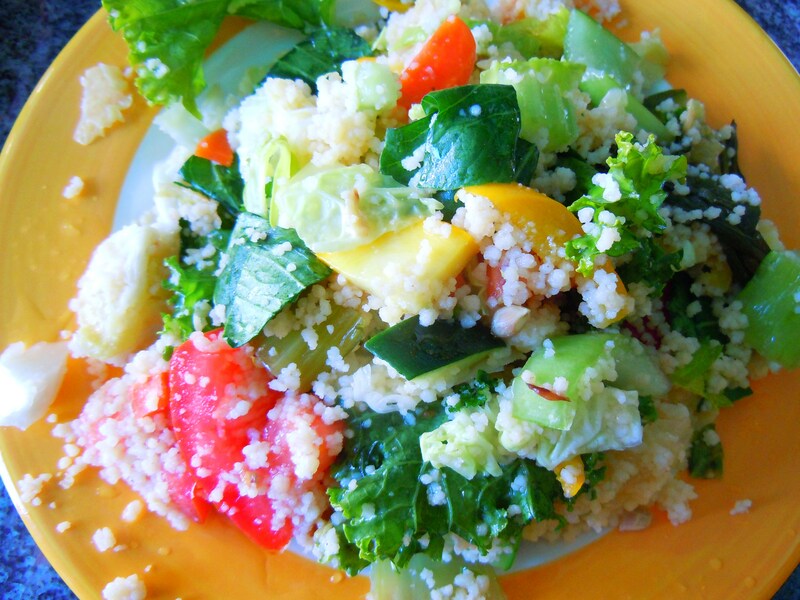 THIS time, I have for you a sunny summer salad of fluffy couscous with zucchini and leafy kale! It was a summer salad chock full of juicy tomatoes, yellow bell pepper, celery, cabbage, zucchini squash, and lots of fresh, crunchy kale. When I saw the mountain of salad up on the food counter, I had to restrain myself from grabbing the large metal spoon used for scooping and just going to town with it. I ate kale for the first time last winter (funny enough, I did so at Kale Eatery by Yonge & Eglinton) and I bought my first fresh batch from the Trinity Bellwoods Park farmers’ market earlier in the month and these days I just think to myself, “where have I been all this time? I’ve been missing out!”. 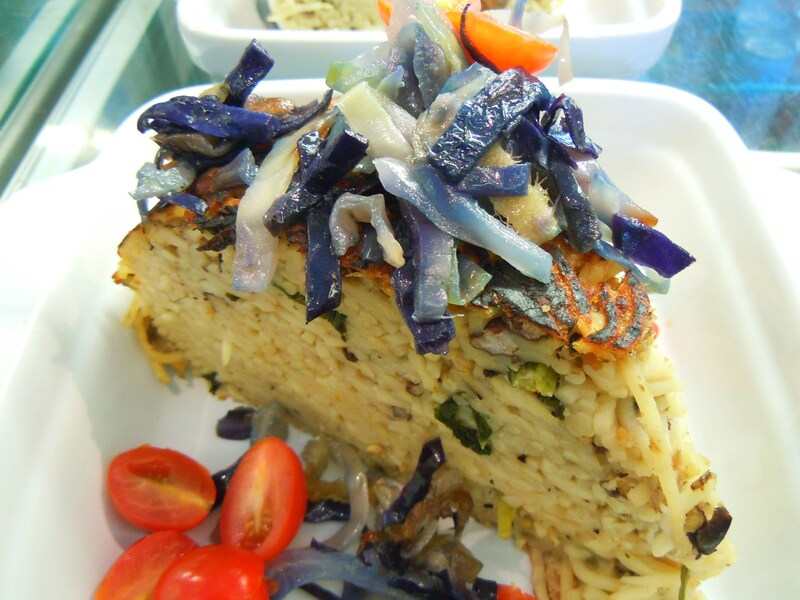 Mela has not only been a place to make great friendships and to eat happy wiggling-inducing food but it’s also been a place to learn, specifically about all sorts of vegetables and yummy ways to pair them up with other vegetables, grains, and proteins. I could eat the salads here endlessly and what I really love about the food here is the variety of vegetables and the ways that they’re paired together. You’ll find everything from sweet potatoes to kale, rapini, beets, watercress, green beans, peppers, cabbage, broccoli, cauliflower, snap peas, asparagus, and more. 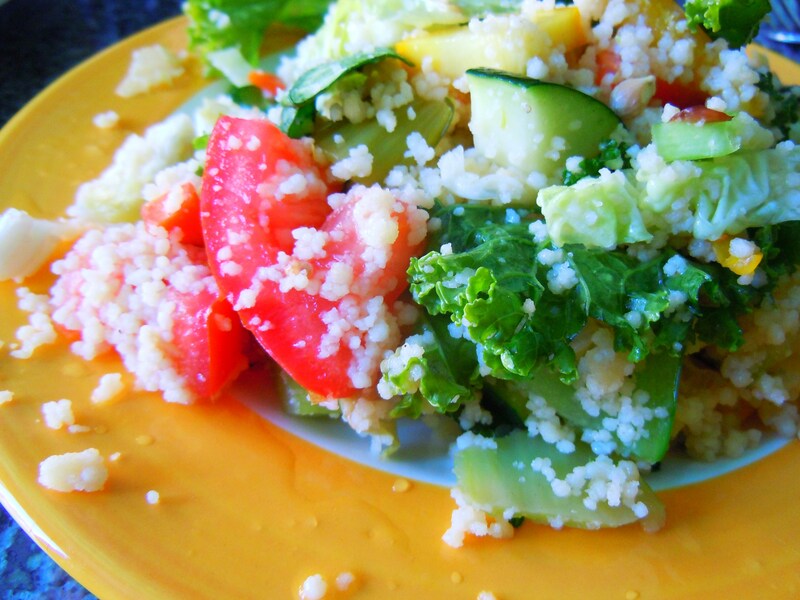 Not to mention there’s always a grain or a protein involved (chickpeas, quinoa, and couscous thus far I’ve seen) which bulks up the salad even more in its nutritional levels. Mela’s salads aren’t overladen with dressing, they’re not dry and boring (lettuce and tomato does not make an exciting salad, ever), and there’s always something different. This is the 3rd salad I’ve tried and I anticipate there will be a hundred more to try as time goes on! Oh, and if you’re wondering about the plates of food on the table, no, they were not all mine! I love to eat, yes, but I do not have the stomach to eat 3 plates of food! Summer might be winding down, but the memories of food and friends last forever. 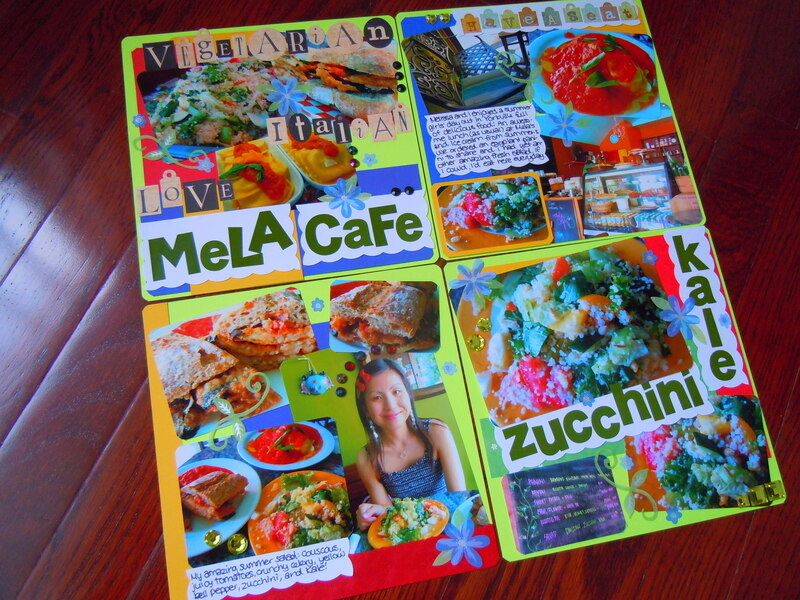 Thanks for the memories, friendship, and an amazing delicious year, Mela. I can’t wait to see what another year will bring. Scrapbooking materials used: neon green, goldenrod yellow, indigo, and cobalt blue cardstock (Recollections); red paper; Grass & Flowers patterned paper (Sandylion); burgundy, beige, and black alphabet stickers (K&Company); green-and-brown alphabet stickers (Make It Special Crafts by Dollarama); olive green alphabet stickers (Recollections); violet flower stickers (Sticko); yellow jewel adhesive gems (Sandylion Essentials); red and black adhesive gems; scalloped edge scissors (Provo Craft); black felt tip Sharpie. Even though these photos were taken a few months ago, these photos tell the story of a meal that was very memorable and pretty special. 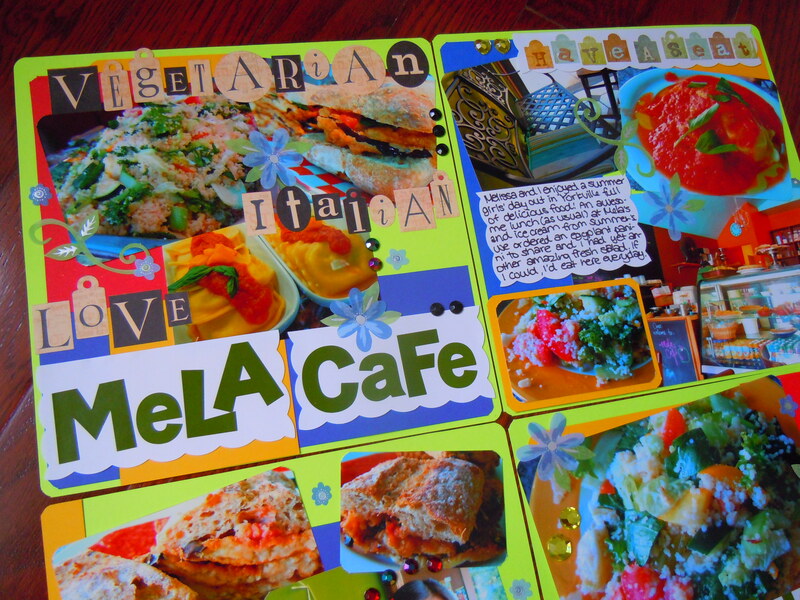 I stumbled upon Mela Cafe in Yorkville last September and after raving on and on about it to my mum and brother, I finally took them with me this past May and it was a vegetarian Italian feast to remember! They met Roberto and a few of the other girls, and my friend and fellow Mela lover, Jennie. It was such a great meal full of amazing food and great company and I’m so glad my mum and brother were finally able to see (and taste!) what I loved so much. 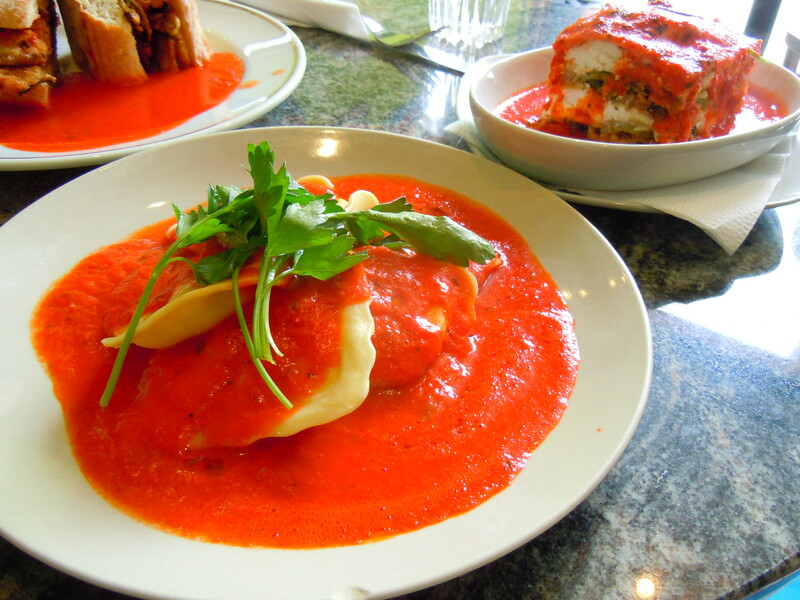 Since it was my mum and brother’s first time here, I wanted a mix of new dishes and old-time favourite so we ordered four dishes to share among the three of us: the vegetarian lasagna with layers of broccoli, cabbage, basil, and ricotta, covered in piping hot tomato sauce; the crunchy eggplant and basil panini sandwich; the to-die for ravioli made with fresh ricotta and parsley, bathing in their signature tomato sauce; and a plate of bright and crunchy quinoa salad! I find that coming here with one or two others makes eating reeeeally fun because often times there are multiple things I want to try (and I can guarantee you that you’d feel the same way after coming here) and sharing a few dishes means everyone gets to try some of everything. To me, the ideal dining situation is for two people to order three dishes. 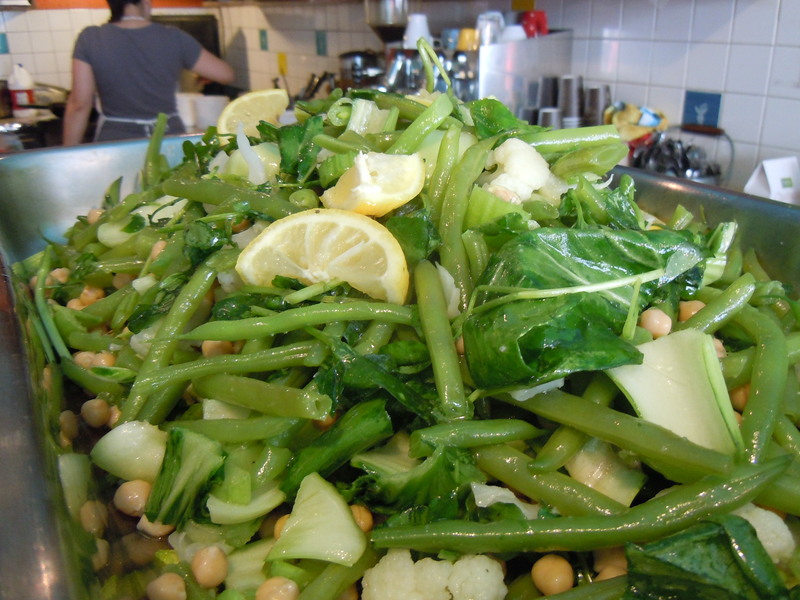 Ever since I had Mela’s watercress spring salad with its crunchy green beans, chickpeas, and fruity olive oil dressing, I’ve become somewhat obsessed with the desire to eat each and every single salad Roberto dishes up each time I go. 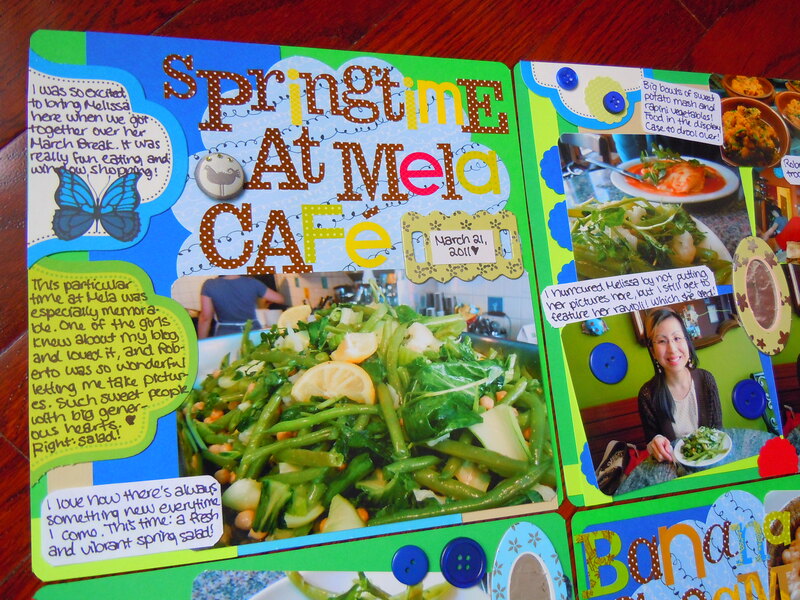 I know it’s a business and I know new menu items keep customers coming back, but I’m still amazed at how many different vegetarian and vegan dishes Mela Cafe doles out every day. They started baking and serving delicious vegan desserts on a regular basis earlier in the year (remember the amazing mini vegan banana cream pies? 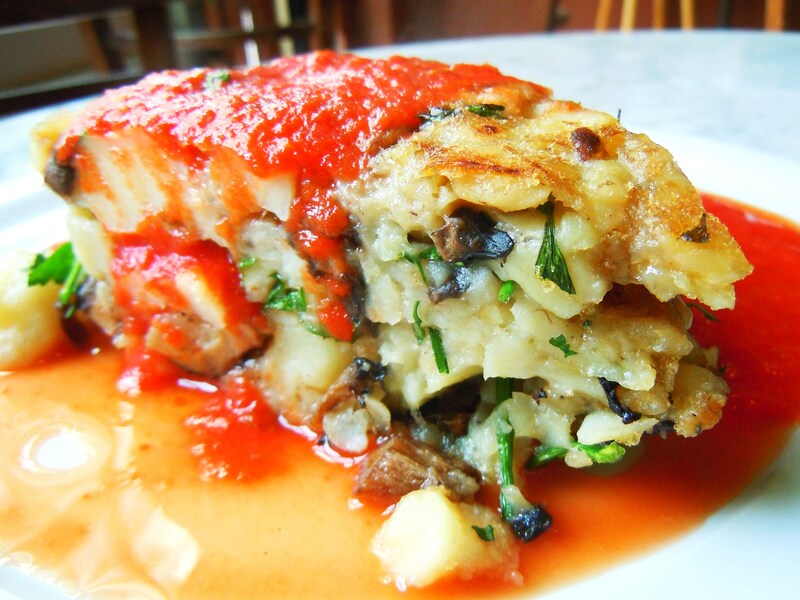 ), and during my past few visits, I’ve noticed new dishes such as stuffed portobellos and giant stuffed bell peppers with brown rice and vegetables. Obviously I’m not there every day (part of me wishes I was), but every time I do pay Mela a visit, there are always several dishes that are completely new to me and I find myself feeling like I’m on a perpetual hamster wheel, attempting to keep up. I don’t mind at all though because it means there will always going to be something new to look forward to along with reliable everyday favourites. 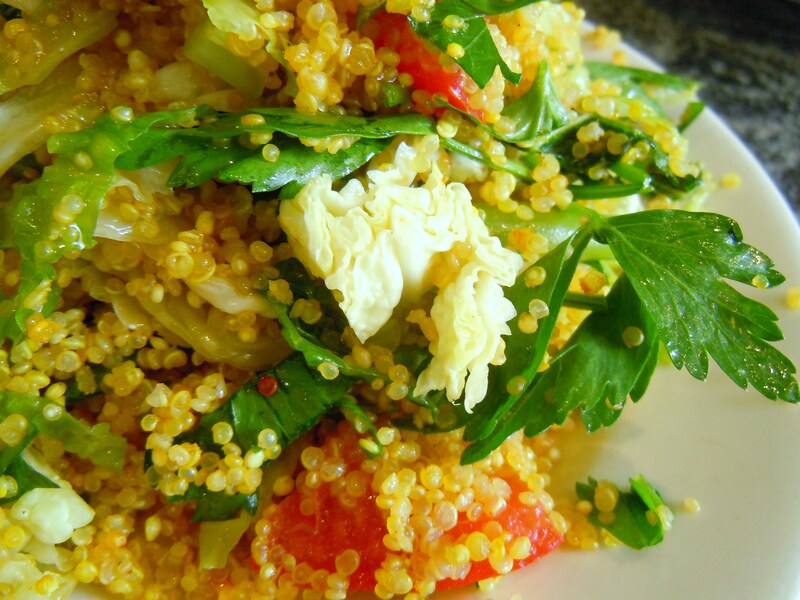 The salad for that day was the quinoa salad dressed in their delicious olive oil with fluffy quinoa, crunchy cabbage, juicy tomatoes, green beans, shredded kale, and lots of parsley! The salad was so crunchy and juicy from the chunks of cabbage and tomatoes and I can’t sing enough praises about the olive oil. 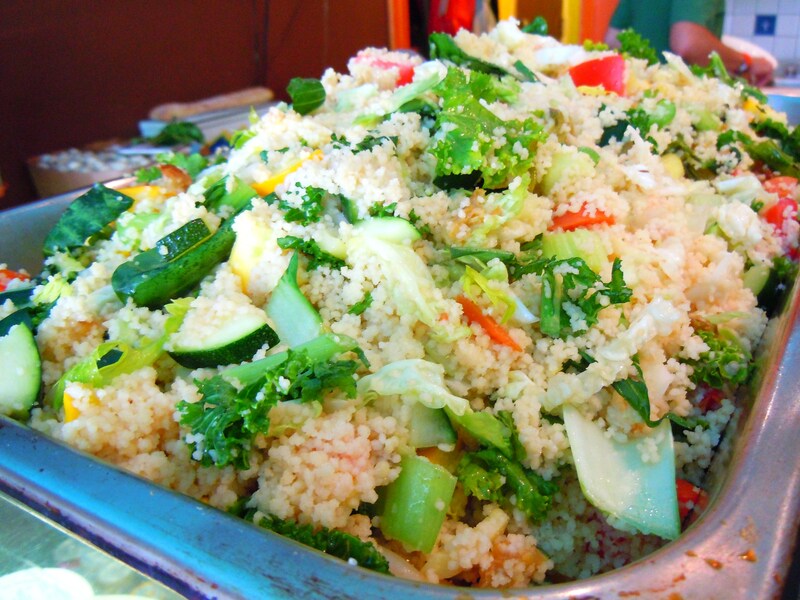 You will never want to eat a salad any other way after eating a salad from here. 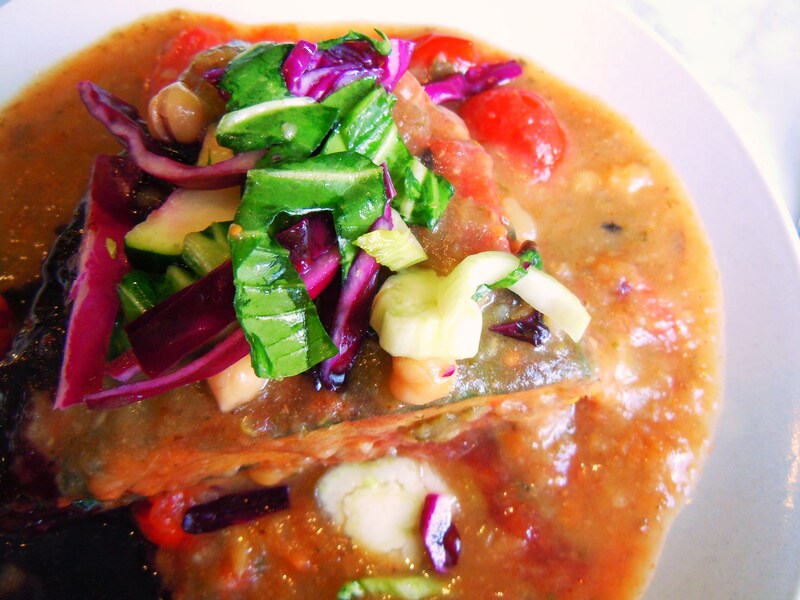 Roberto always incorporates lots of vegtables, grains, and proteins with different textures and colours, really showing the breadth of vegetarian and vegan cooking. His salads are the perfect example of how they can function as a main dish and how salads don’t have to fall into that awful “lettuce and tomato” stereotype and rut. A fresh batch of homemade vegan coconut lime cream tarts ($4) finished the meal off. These tarts were out of this world. Even though my best friend and I loooove their mini vegan banana cream pies to death, these coconut lime tarts were wonderful too. 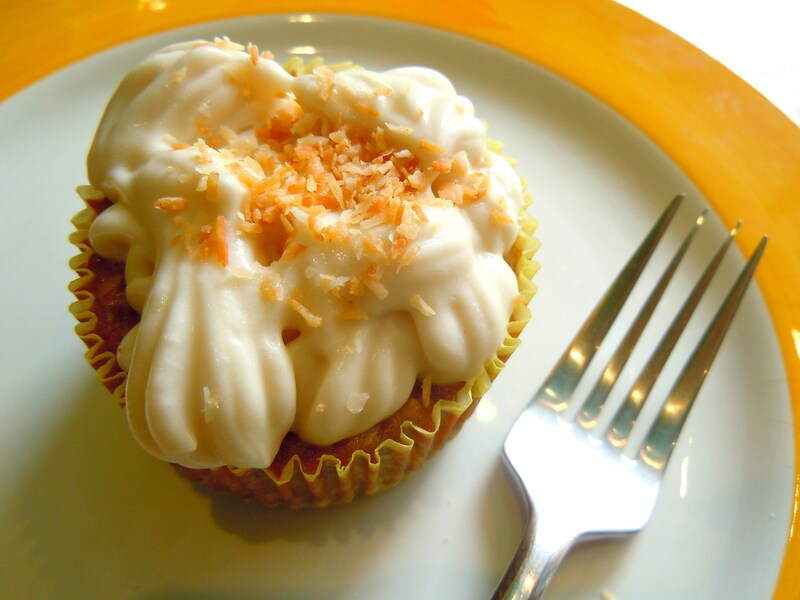 The cake was so moist and zingy and the coconut cream was light and airy with a generous sprinkling of toasted coconut on top. The tarts had this amazing lightness to them with subtle hints of ginger flavour. After you eat these creamy tarts, your mouth feels cool and fresh all over and its unlike any coconut dessert I’ve ever had. They’re not too sweet in the least but you get that decadence from the whipped coconut cream and soft cake. Roberto’s lovely lady vegan baker is responsible for Mela’s sweet eats and on any given day, you’ll see either tarts, pies, muffins, and other individual desserts. 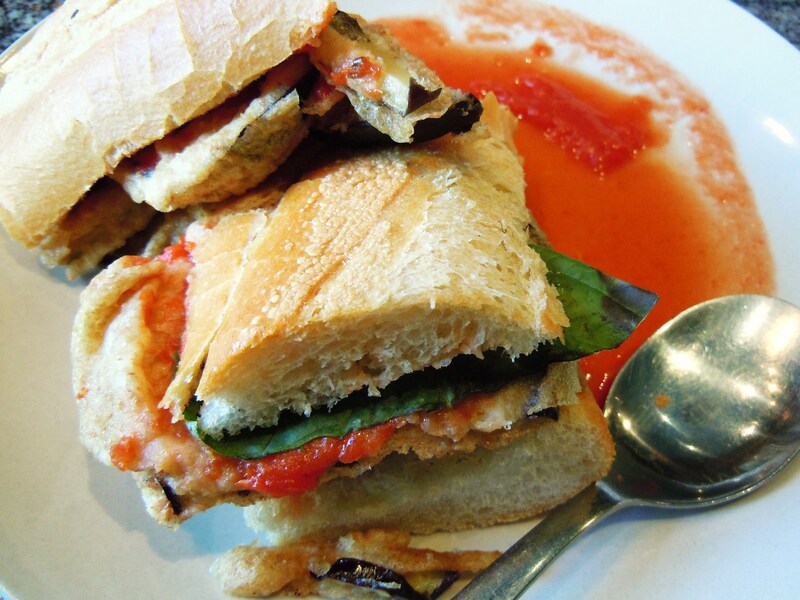 A picture post for the Vegetarian Sandwich Series dedicated to Mela Cafe’s crunchy, savoury, flavourful breaded eggplant panini sandwich! I’ve raved about Mela on the blog many times and I couldn’t imagine not including this everyday staple in the series. 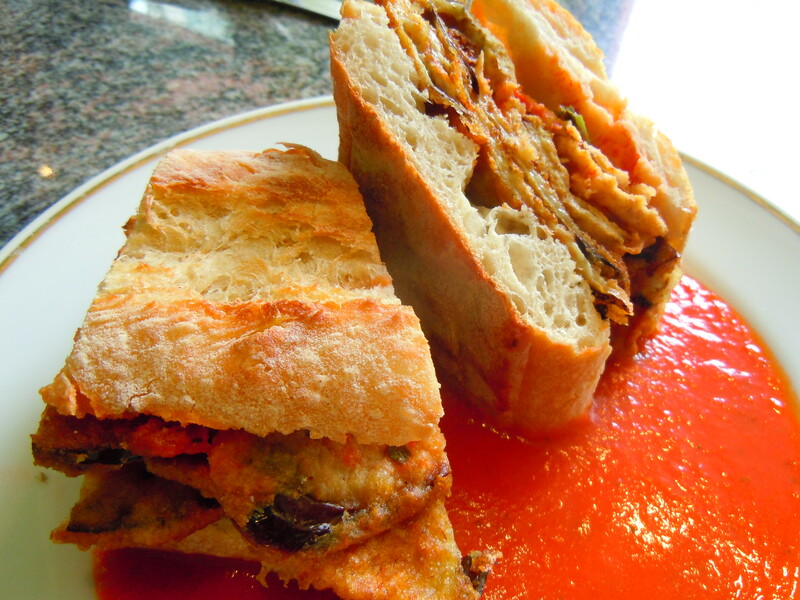 The panini is outfittedwith large slices of crispy breaded eggplant, fresh leaves of basil and served with Mela’s sweet tomato sauce. 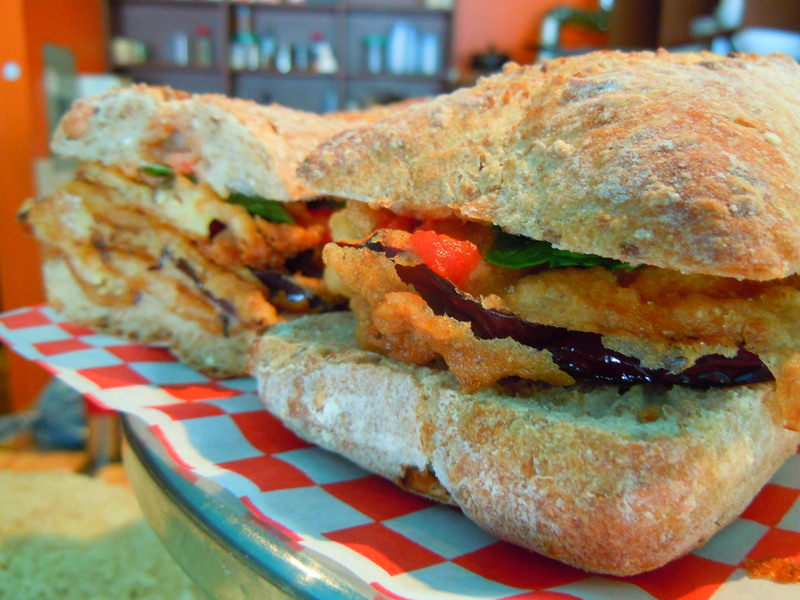 The eggplant panini is a permanent, everyday menu item at this Yorkville Italian vegetarian spot and the saltier crispy breaded parts along with the fresh bite from the basil are my favourite things about this sandwich. 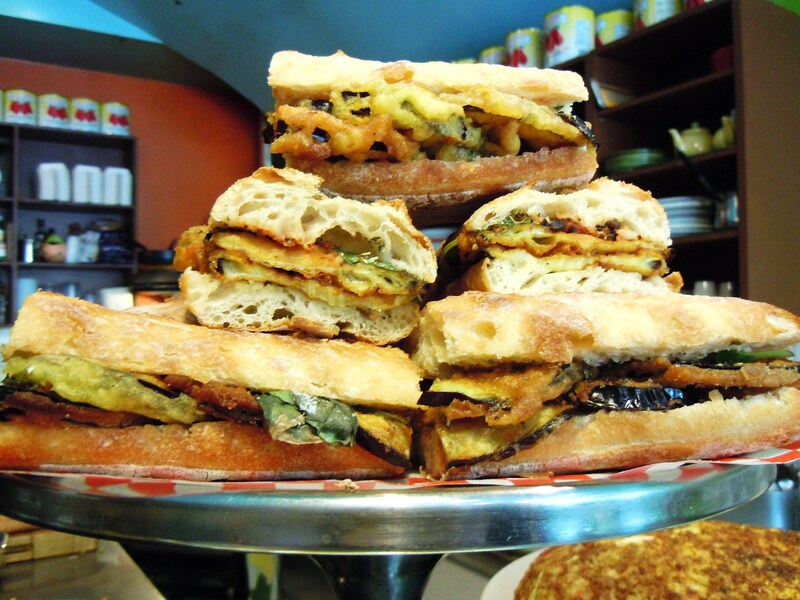 By 11am, these sandwiches are made fresh and piled high on the kitchen’s display stands and are made with the utmost of love and care by the cafe’s owner, Roberto. 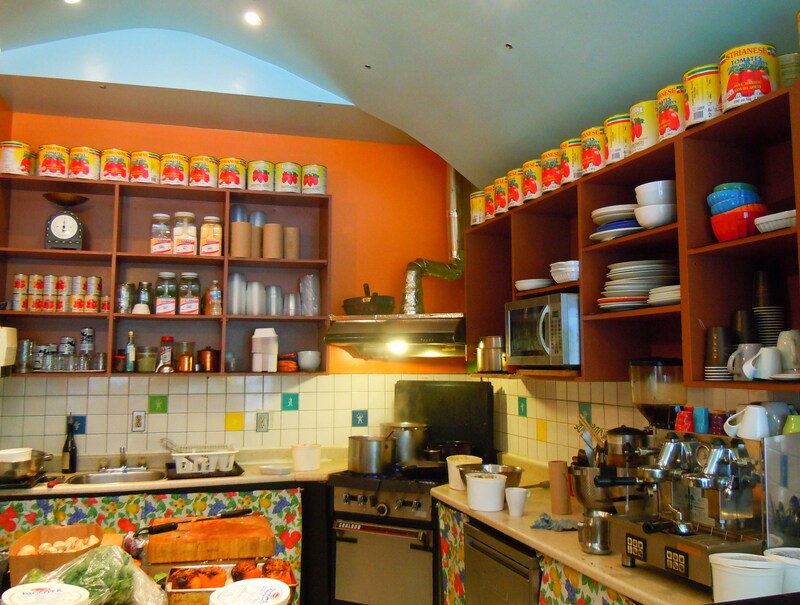 Mela epitomizes fresh food and vegetarian/vegan love in a home-is-where-the-heart-is Italian kitchen with its fresh market vegetables and creative, delicious dishes. 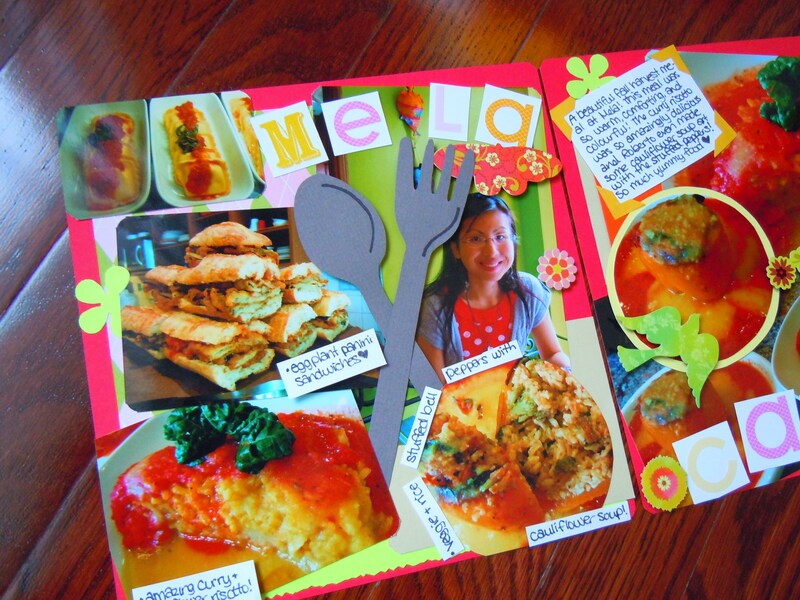 For my original Mela Cafe blog post featuring this sandwich (and other Mela Cafe posts and scrapbook layouts), click the links below. 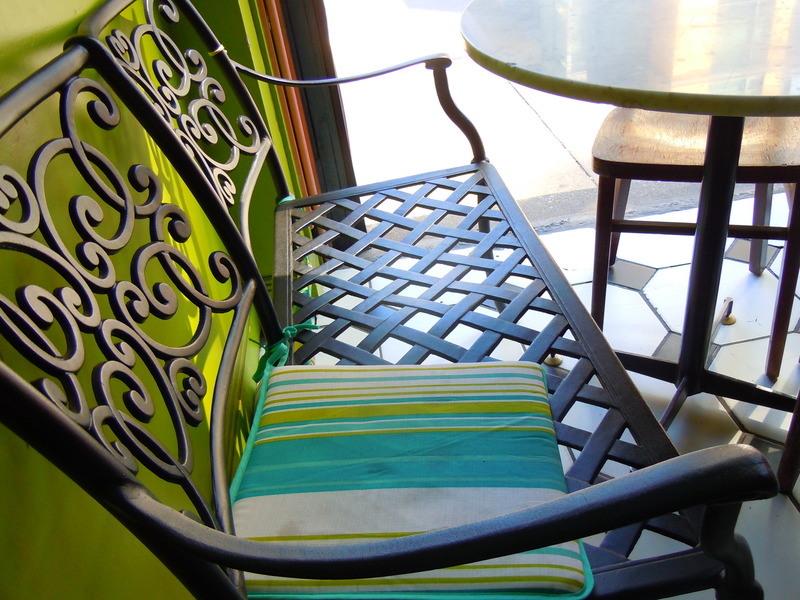 Mela Café is located at 7 Yorkville Ave., north of Cumberland St. and just west of Yonge St. 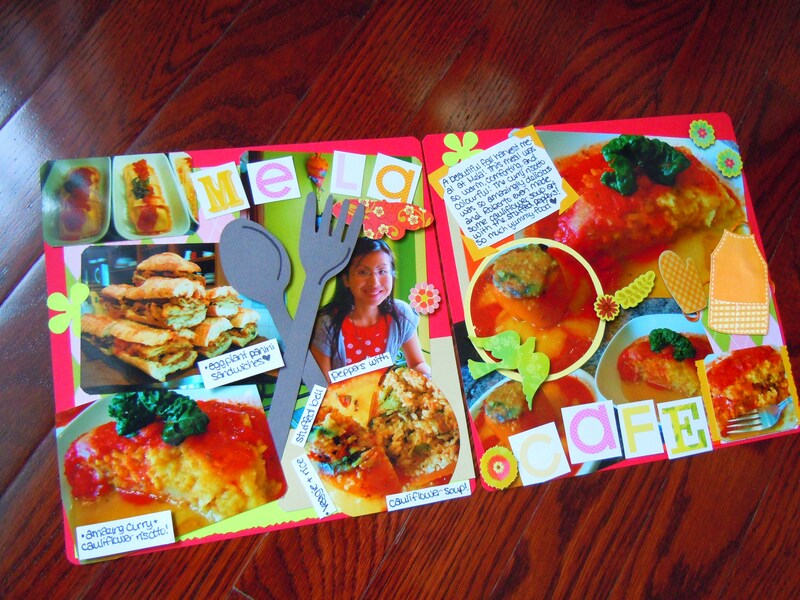 It figures that I would create and post some of my cheeriest scrapbook pages on one of the most atrocious spring weekends. As I was cutting out scraps of cardstock and snipping ribbon at my kitchen table early afternoon, I turned around to look out the window and saw the sky raining rice krispies. Or as a meteorologist would say, tiny bits of hail. I even did a double take when I woke up this morning and saw a light layer of snow on my neighbour’s rooftop, which melted within an hour into a wet mess. 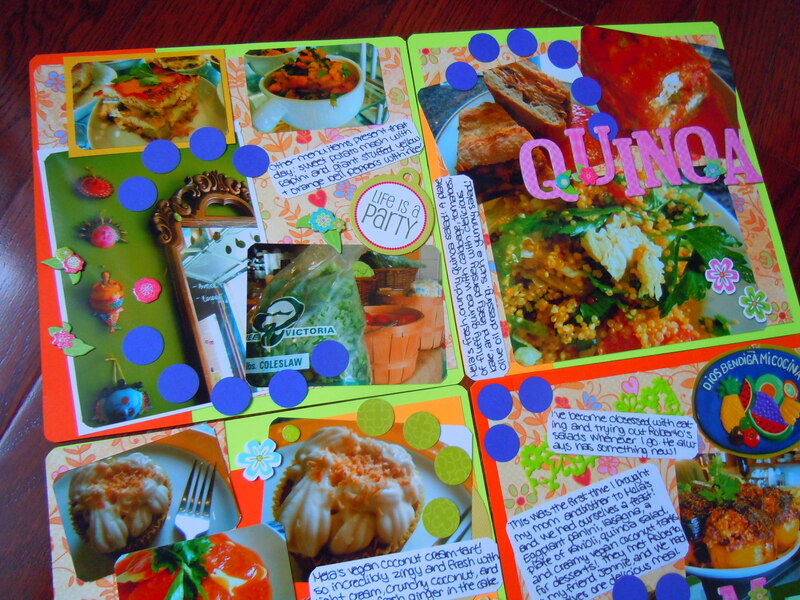 If it’s any consolation, I have pretty things like ribbon and metal brads to show off and pictures of yummy food! Even though this meal wasn’t part of Veggielicious (since this was from March), what I’m showing you all today could very well be something you could eat when you go to Mela Café this week, depending on the selection they have for the day. 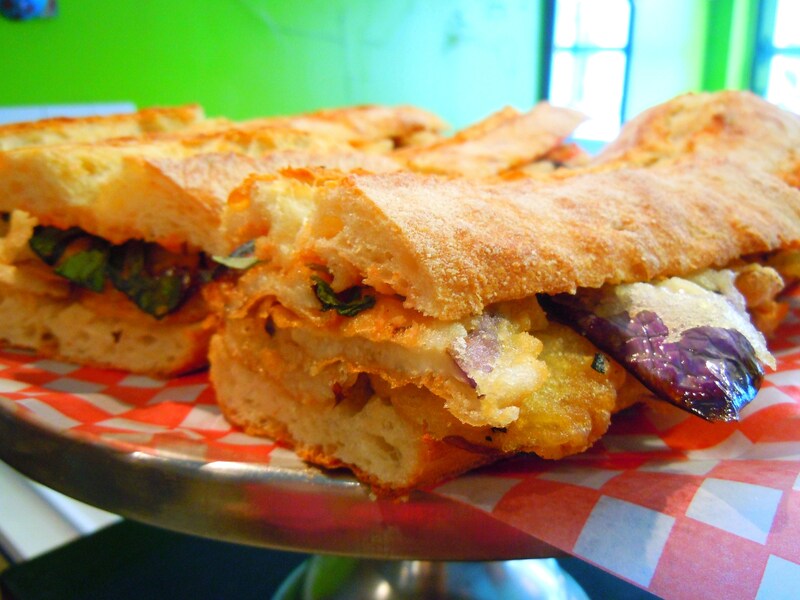 This is the last week of Veggielicious which runs until Sunday, April 24th. 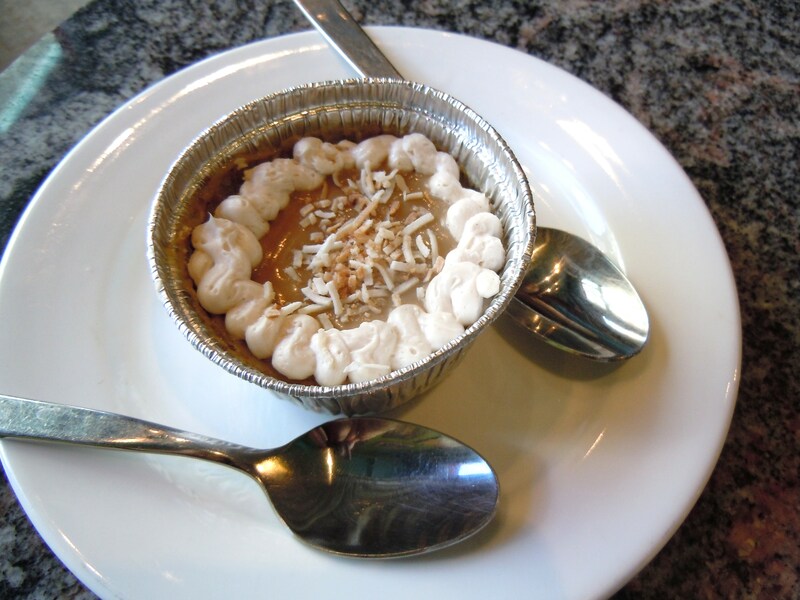 Mela’s price fixe of $15 gets you a delicious vegan dessert and two of the following, your choice: panini sandwich, soup, and salad. 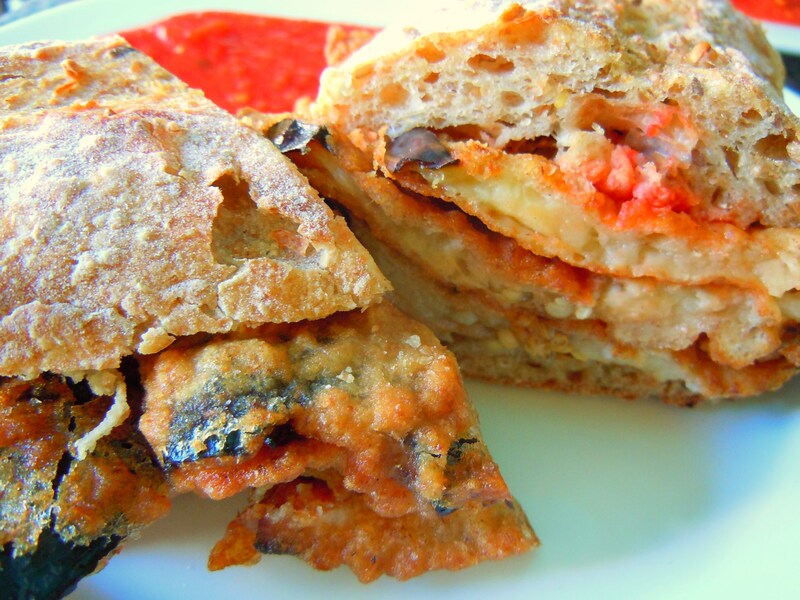 If you haven’t seen my post about their amazing vegan eggplant paninis, check it out here! 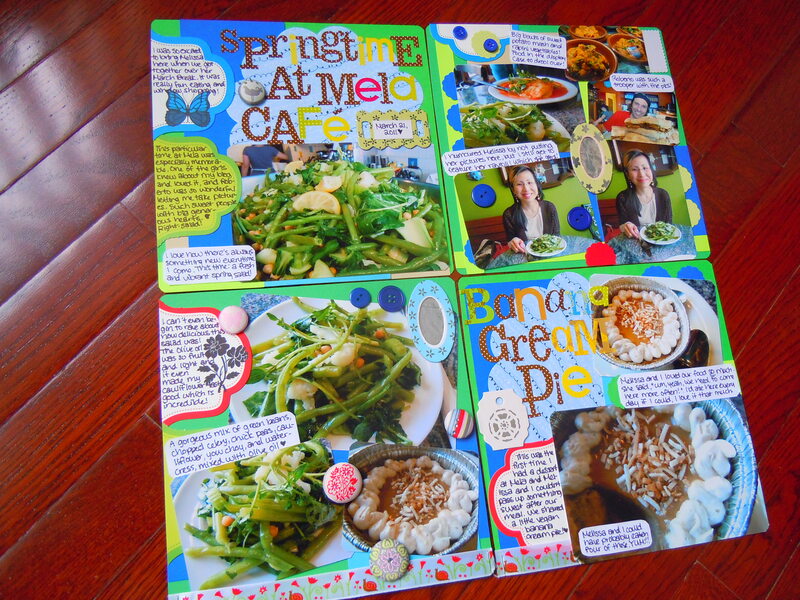 And to help fill in the blanks and give you all an idea of what their salads and desserts are like, I have pictures of their bright watercress spring salad and vegan banana cream pie dessert! This meal was so much fun. I brought my best friend here during her spring break and it was the first time I had a salad and dessert here (the other times I had the eggplant panini and their famous ravioli! ), so I was super excited! I mean, it shouldn’t come as a surprise to me anymore, but every time I come here I am blown away at how light and delicious everything is. I KNOW everything here is awesome, but there’s always something that throws me for a loop, keeps me on my toes, whether it’s the fusion of different flavours or textures. 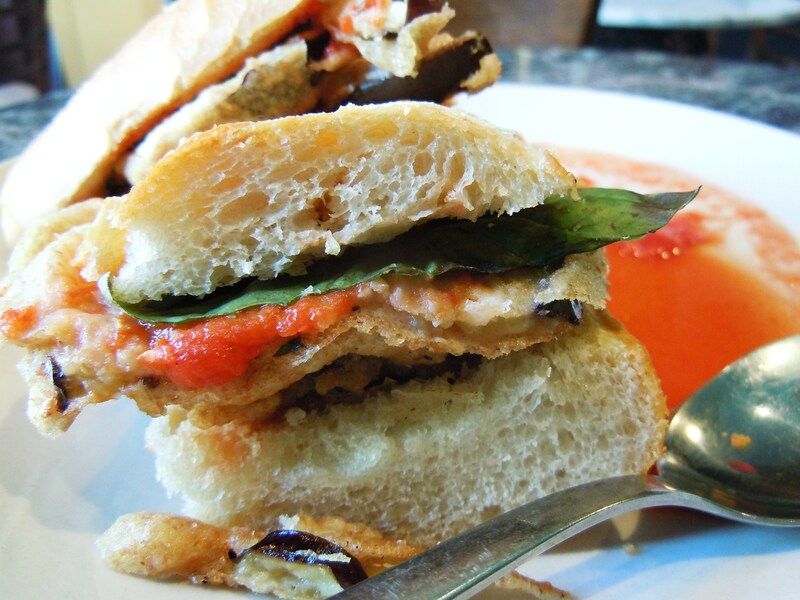 With the eggplant panini, it was the contrast between the crispy breaded eggplant and the sharp, fresh flavour of basil leaves. 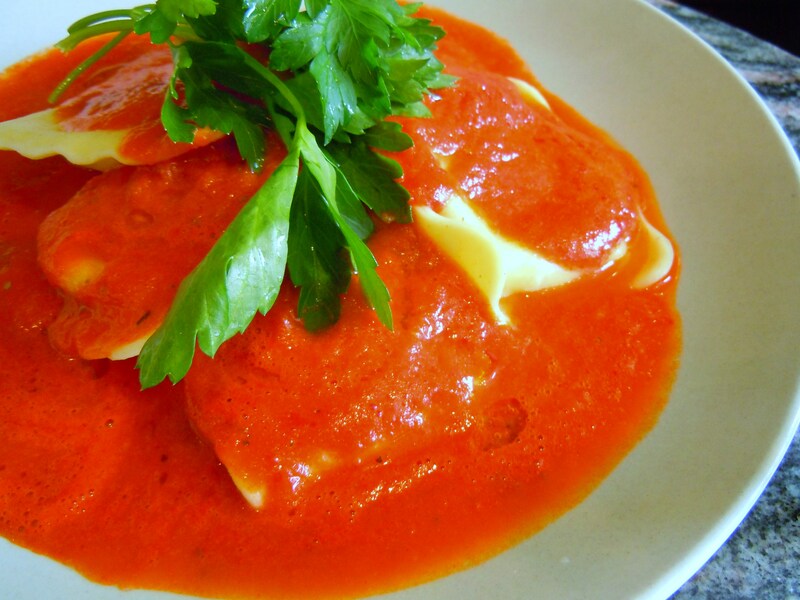 With the ravioli, it was lightness of the tomato sauce and the airiness of the ricotta. And with the salad? The bright, refreshing flavour of the olive oil. It just blew me away. 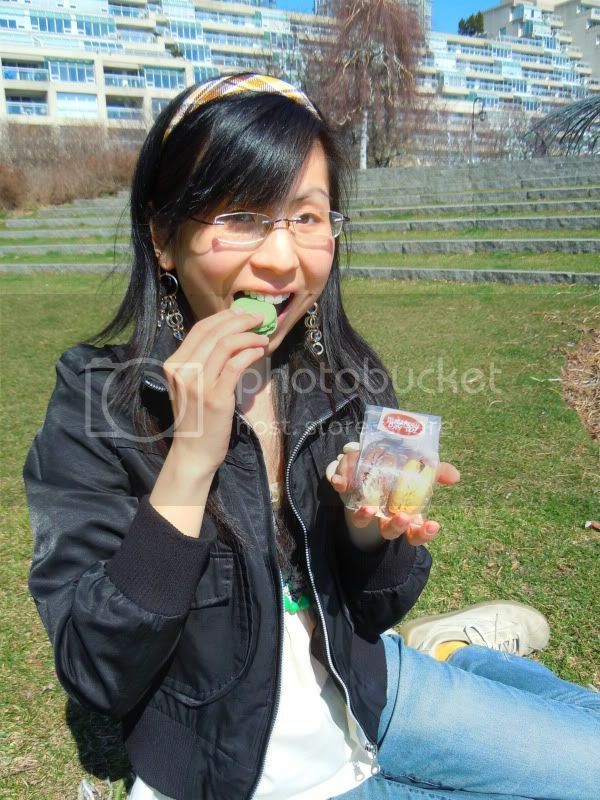 I swear, a bright green spring salad is not a salad unless it tastes like this. Oh my goodness. 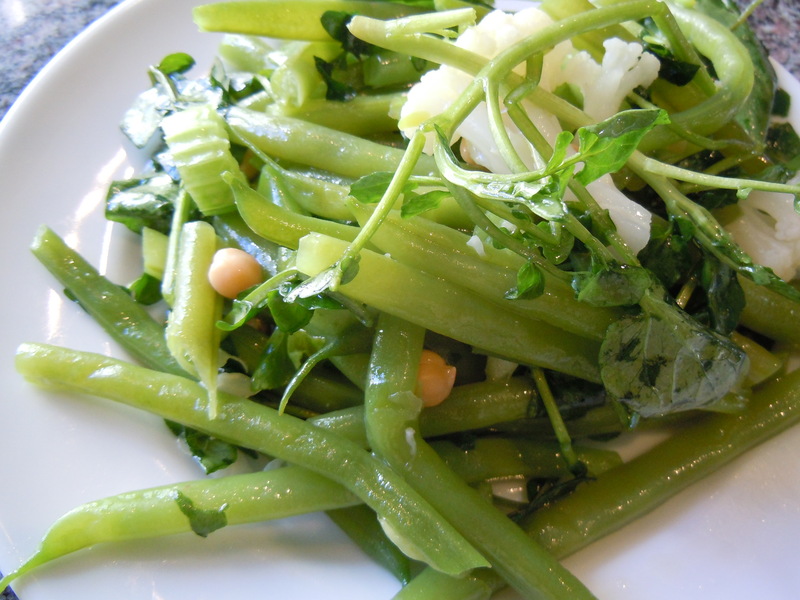 For one thing, I was chomping on the bit with my green beans. I love green beans so much. 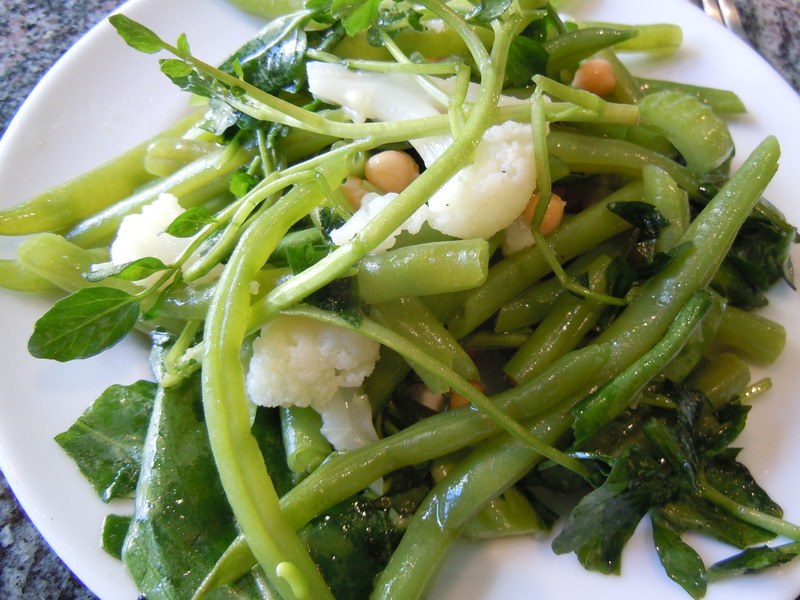 The spring salad was a fresh mixture of green beans, chopped celery, Shanghai bok choy, cauliflower, watercress, and chick peas. And of course, a meal is not complete without dessert. At least no meal in my book! My best friend and I were noshing on our food (me with my spring salad and her with a plate of ravioli which I recommended. She loved it so much and said she could eat 3 plates of it, ha!) and were contemplating going back to Pusateri’s gourmet market down the road in Yorkville for a dessert. We saw the vegan banana cream pies and chucked that idea straight out the window (sorry, Pusateri’s, but you got ousted!). 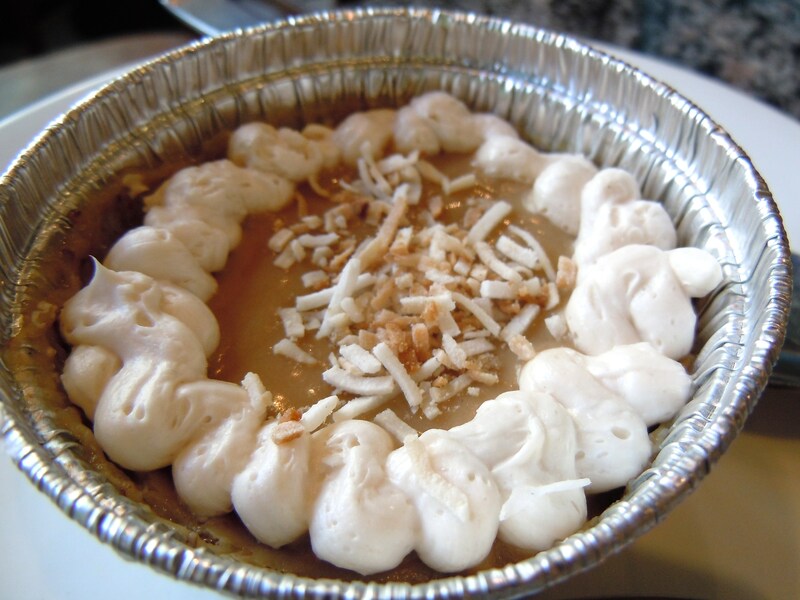 There was no way in hell we were going to pass on fresh, homemade desserts at Mela. And I’m so glad we didn’t. This dessert was divine. My best friend and I could have eaten 4 of them. 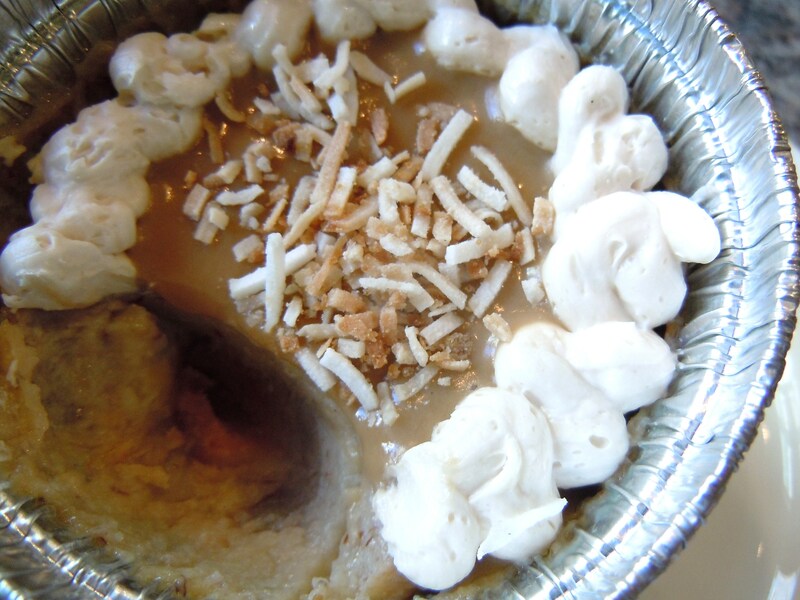 It had the bold banana flavour that you’re used to getting from fresh baked banana bread, the texture and consistency of thick custard pudding, and piped vegan cream and toasted coconut on top. We were so busy mmming over it that I completely forgot to ask Roberto what was in it. Oops. I’ll get on that for next time, promise! 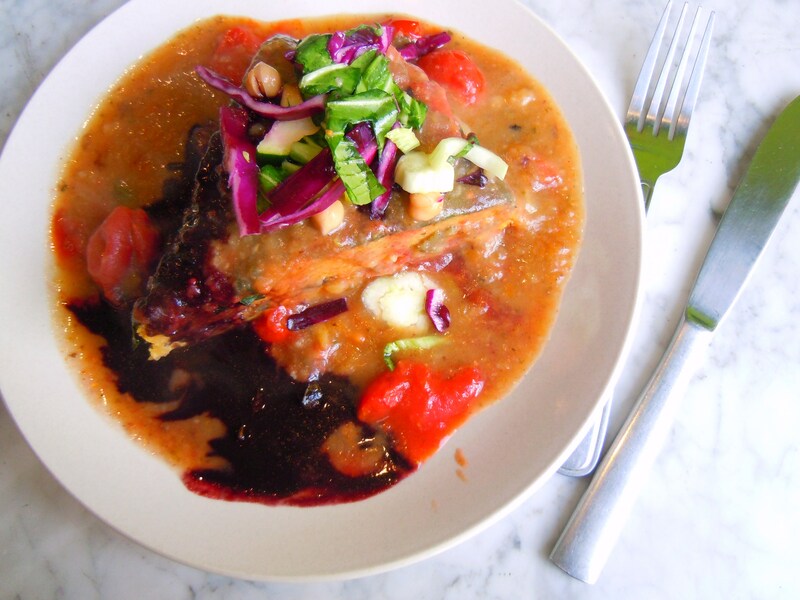 Enjoy the last week of Veggielicious, everyone! Mela Café is located at 7 Yorkville Ave., north of Cumberland St. and just west of Yonge St. Their regular hours are from 10am-5pm, but they are open on Thursday and Friday during Veggielicious until 8pm. Scrapbooking materials used: emerald green, grass green, neon green, cobalt blue, and beige cardstock (Recollections); powder blue scalloped patterned paper (Colorbok); journalling tags (Darcy collection by Anna Griffin); brown and white polka dot alphabet stickers, spring time alphabet stickers (K&Company); spring themed metal brads (Amy Butler for K&Company); chipboard patterned embellishments (Winners Homesense); spring time flower and snail ribbon (Sweet Little Fairies by Michael’s); sewing buttons; medium scallop circle paper punch (ek success); aluminum foil.